In today’s environment of instant celebrity and superstar burnout, it’s hard to fathom the full extent of Frank Sinatra’s fifty-plus-year career and the impact it had on generations of people across the world. 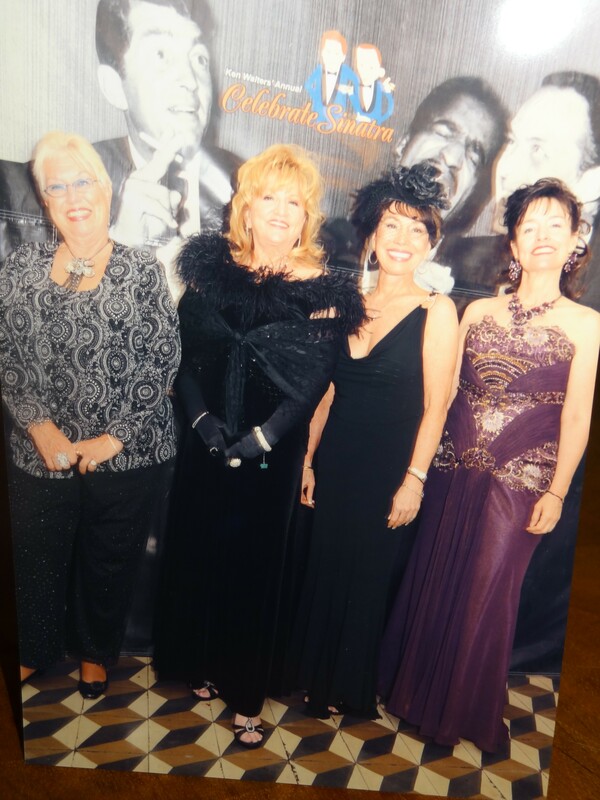 But it’s no surprise that my friends and I found ourselves at Ken Walters’ 16th Annual “Celebrate Sinatra” event in Ybor City. 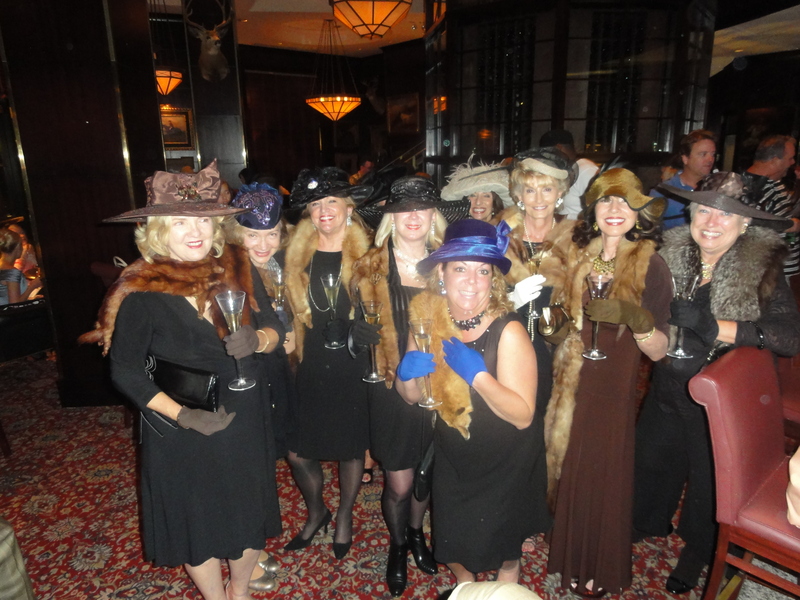 We were dressed to the nines and I, of course, was wearing a hat! We were transported in time to the Cal Neva Resort and Casino on the shores of Lake Tahoe, once part-owned by Sinatra. 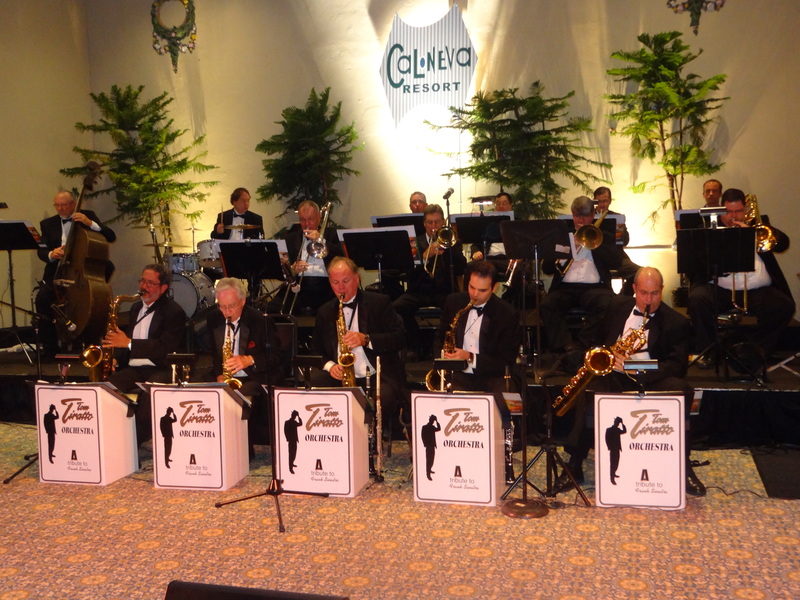 We quickly snagged our Signature Martinis, and, as we walked into the ballroom, the dynamic sounds of Tom Tiratto’s 17 piece Big Band Orchestra swept across the room. Wanting to preserve a memory, Shirley, Lucy, myself and Lori posed for a picture on the main floor of our venue, The Cuban Club. However, I found myself without cash and had to resort to borrowing $10.00 from our gracious host, Ken Walters. Thanks Ken. And the check really is in the mail! In the creation of the album, “It Might As Well Be Swing” in 1964, Sinatra included what would be some of his best recordings, including “Fly Me To The Moon” and “The Best Is Yet To Come”. Tom Triatto sang these songs beautifully. And Of course the floor was filled with exuberant dancing couples. Frank is quoted as saying: “Throughout the years on the record dates I’ve done, I’ve never been comfortable in a separate room away from the orchestra ….I feel I need the support of the sound of the orchestra in the room.” Frank had Count Basie, however I must say that our orchestra this evening was impressive. 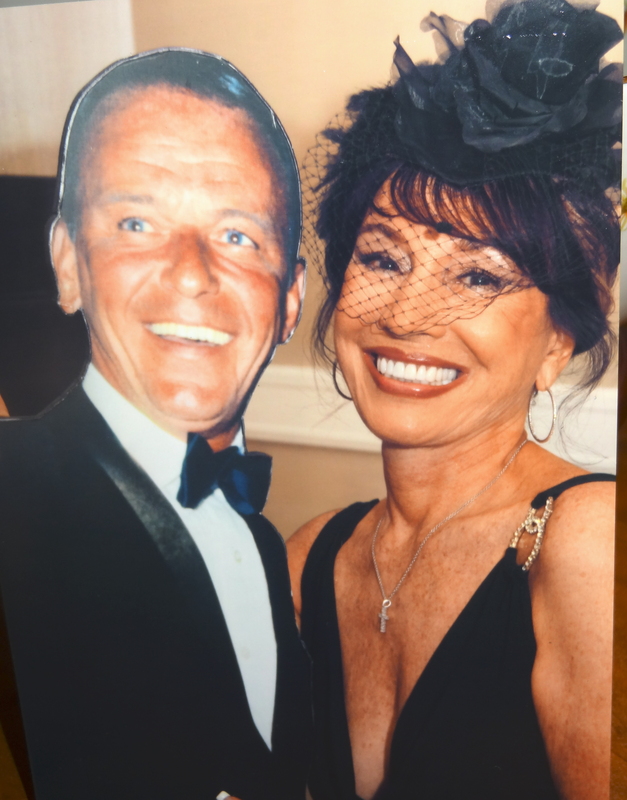 It’s always fun to mingle and chat with other guests, especially when the women are dressed in lovely gowns and the men in Frank’s signature look: a Tuxedo and a crisp, white shirt with French cuffs. Definitely, my kind of party. It’s even more exciting for me when I discover other guests wearing hats. 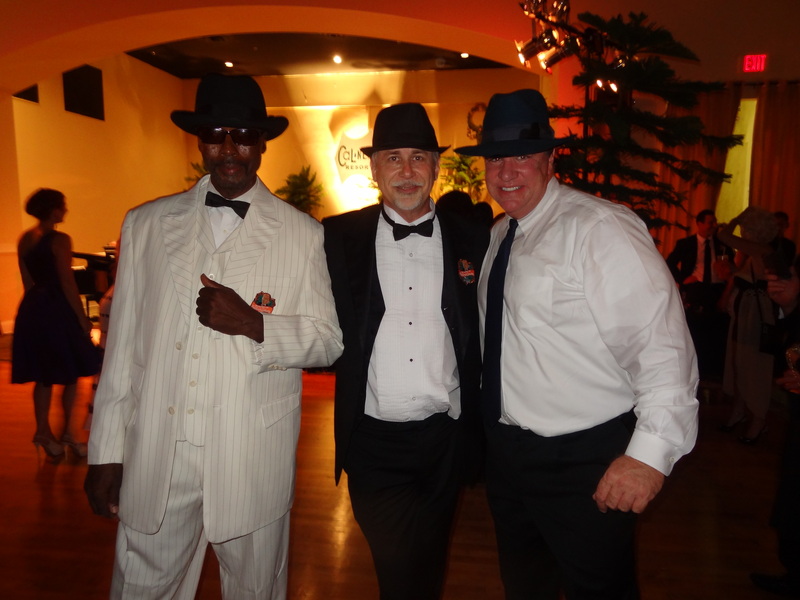 Tonight it was a bonanza – three men wearing fedoras. They graciously posed for a picture looking very dapper indeed. 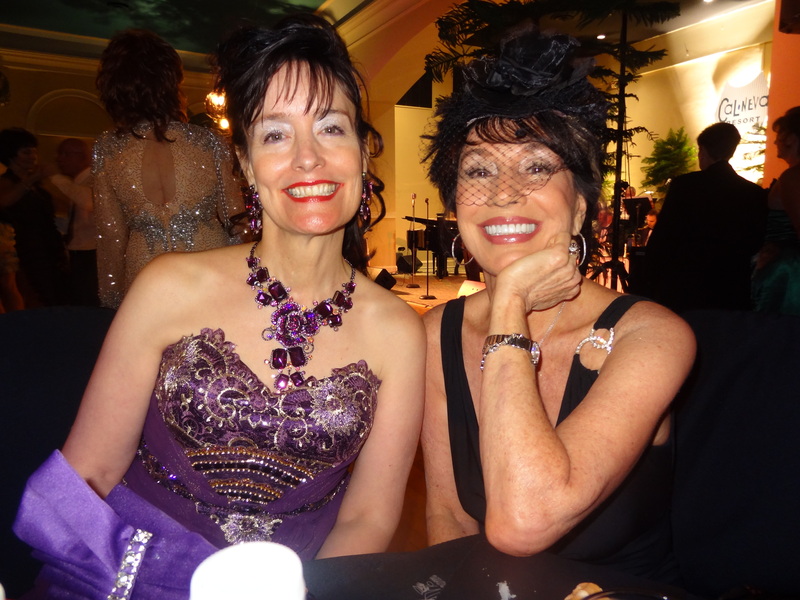 I was thrilled to be with my new friend Lori London who was visiting from Chicago. Lori was invited to sing with the orchestra tonight and she was fantastic. Lori is an amazingly gifted artist. She can sing Jazz, Broadway, Country and Operatic music. She has been on the radio and in motion pictures and her successful concert tours are widely attended. She is sweet and funny and I look forward to seeing her again. 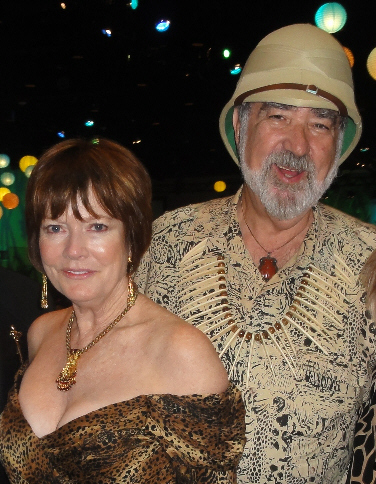 While we didn’t spend much time in the Copa Room, it was filled with Rhumba, Cha Cha, Merengue and Mambo movements as couples danced to Ignacio Marin’s Latin Lovers. The bar was bustling, hors d’oerves were being served table-side and there was vintage 1940’s “cigarette girl” selling premium cigars. This was a well thought out party! Seven decades have passed since Las Vegas first presented its entertainment. Many performers have come and gone, but few of those showmen left legacies that no number of passing years can erase. One such man, whether referred to as “The Voice”, “The Chairman” or “Ol’ Blue Eyes”, is a man from humble beginnings in Hoboken, New, Jersey: the one and only Francis Albert Sinatra. He was born on December 12, 1915. And I would have to say – “It Was Very Good Year”! 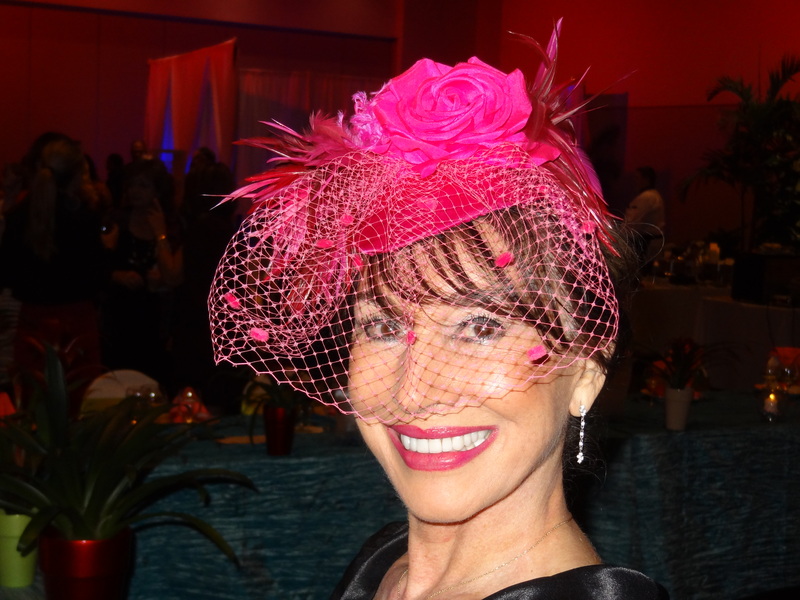 I designed and special-ordered this hot pink hat from my favorite shop in New Orleans. 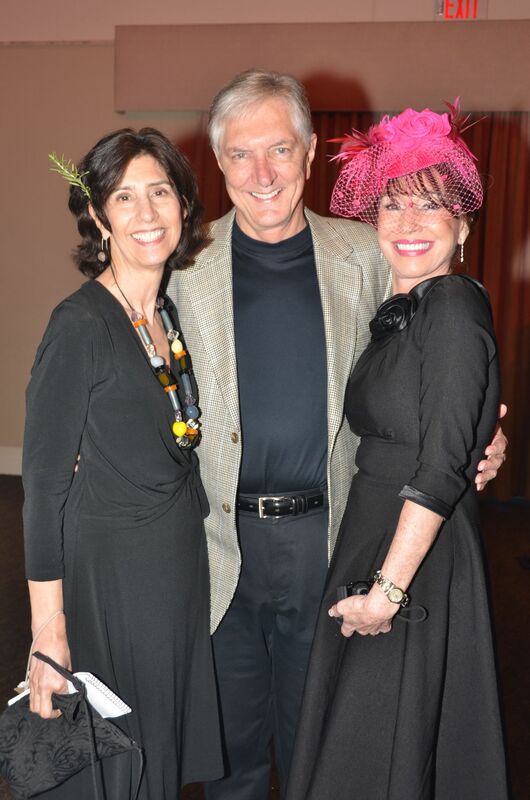 I was thrilled to be able to wear it for the first time to the 2012 Top Chef dinner organized by my friend Maria Lewis, Director of Development for the “newly renamed” Champions for Children organization in Tampa. This event would raise funds to build stronger families through child abuse prevention and family education programs. Twelve participating chefs would prepare – tableside – a five course meal with accompanying wines for a table of 12 or 15 people. They also provide their own linen, china, centerpieces and more to create their own unique vision. 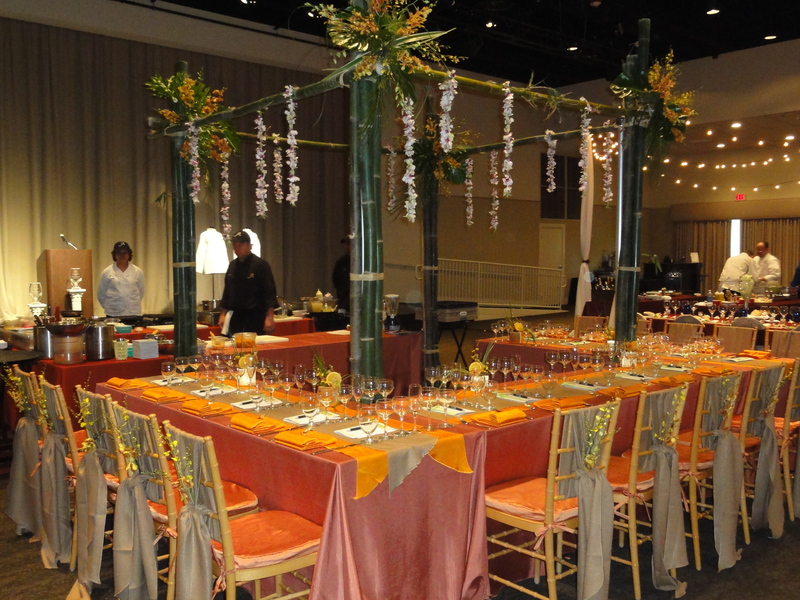 Vying for three prestigious titles: “Top Chef of the Year Tampa Bay”, “Top Philanthropic Chef of the Year” and “Best Table Decor”, the competition looked to be deliciously fierce! My friends and I arrived early to view the gorgeous table decorations and meet the chefs as they were setting up. The tables were all so beautiful that it was hard to choose. 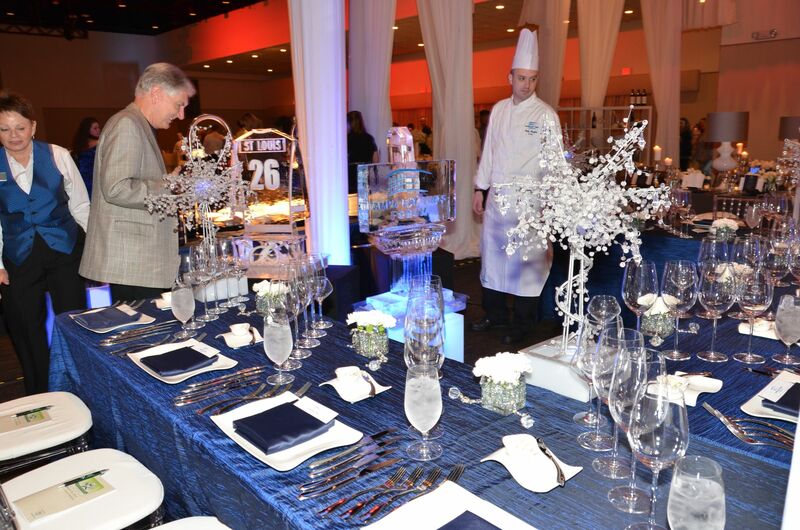 Tampa Bay Times Forum (Chef Rich Mathis) wins the Top Chef award for “Best Table Decor” with the dramatic dark blue tablecloths, elegant place settings and stunning ice sculptures! Anxious to locate our table and meet our own chef for the evening, we were surprized to realize “YOU’RE IN THE ARMY NOW”! We would be dining with Chef Rene Marquis’ with the Special Operations Command at MacDill AFB in Tampa. 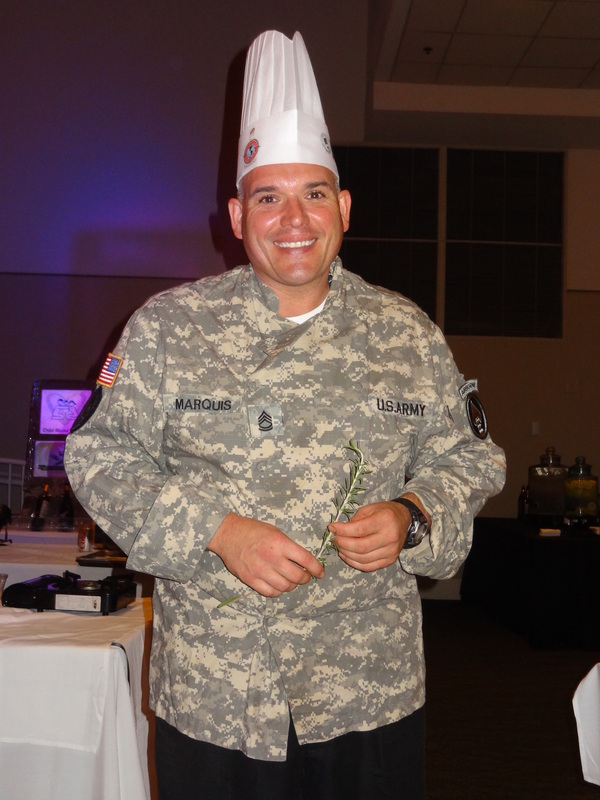 Chef Marquis’ has an impressive background including Senior Chef Instructor at the Army Center of Excellence in Virginia, teaching the flagship culinary course for all of the military services. He trained Teams for the 2006 Culinary World Cup in Luxemborg, placing 4th in the world, and for the 2008 Culinary Olympics in Germany, taking 2nd place with 13 gold medals! Needless to say, we were looking forward to some extraordinary cuisine. I loved the Pelagia Trattoria table and was facinated by Chef Andrew Basch’s Third Course, “Squid Ink Pappardelle with foie gras butter”, served with Valpolicella. This award-winning restaurant specializes in “made from scratch” recipes with menus that change with the seasons. Tampa Bay. And my favorite part – it features live piano music! One of the city’s culinary treasures, L’Eden, offers a menu of international dishes with a strong Mediterranean influence. Tonight Chef Jamgotchian would serve a “Pave de Filet de Boeuf au Poivre et sa Moelle”. His dessert was “Clace au Chocolat, Sauce Vanille”, accompanied by my favorite champagne, “Veuve Cliquot”. Our own menu from Chef Marquis’ was stellar! It started with a seafood trio which inluded “Sauted Sea Bass with Tropical Fruit Salsa”, “Seared Tuna on a bed of Cabbage Slaw” and Blackened Scallop with Succotash”, generously washed down with a Pinot Grigio. A scrumptious “Cream of Broccoli and Carrot Ginger Soup” was next, followed by a trio salad sampler. Our main course was a “Seared Rib Eye with Boursin Yukon Gold Potatoes Braised in Beer with Wild Mushrooms and Au Gratin Potatoes”. We loved it. And we loved that Chef Marquis’ kept his promise and made sure that our wine glasses stayed full! There were some facinating desserts being offered by tonight’s talented chefs, including “Chocolate biscotti, fava bean gastrique and mint oil” (Chef Ryan Mitchell-Fleming’s Prime Steakhouse) and “Not So Old Fashioned Grilled Peach Melba with Toasted Raspberries and Marscapone Mousse over Warm Pound Cake Pudding” (Chef Parker Stafford-Blue Water Grille). After our fabulous four courses, we wondered if we would be able to finish our own Chef Marquis’ unique “Peanut Butter, Bacon and Banana Ice Cream” – but just for a minute! 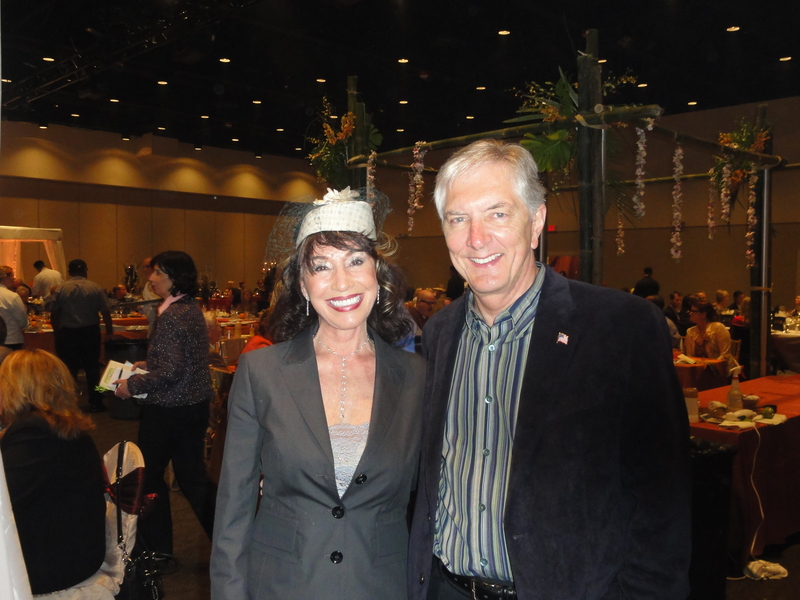 Our Master of Ceremonies was the inimitable Jack Harris who co-hosts AM Tampa Bay, often the highest rated morning show in Tampa. And he can now be seen on ABC Action News. Jack is a gracious host with an engaging personality and would definitely be my top choice to run an auction! The Live Aution Items included exciting dining experiences, romantic “get aways”, concert tickets, tickets to The Tampa Bay Lightning and to the Tampa Bay Rays and several private parties. 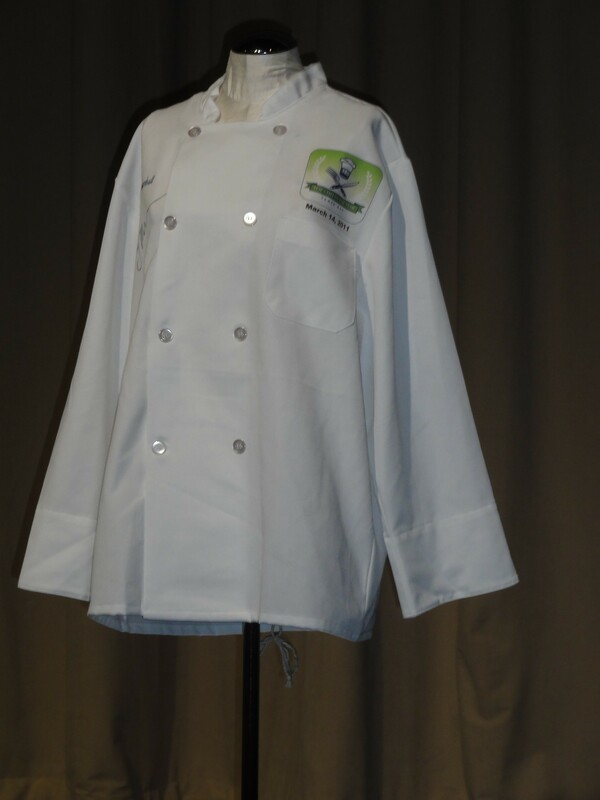 Many items included autographed chef’s jackets. 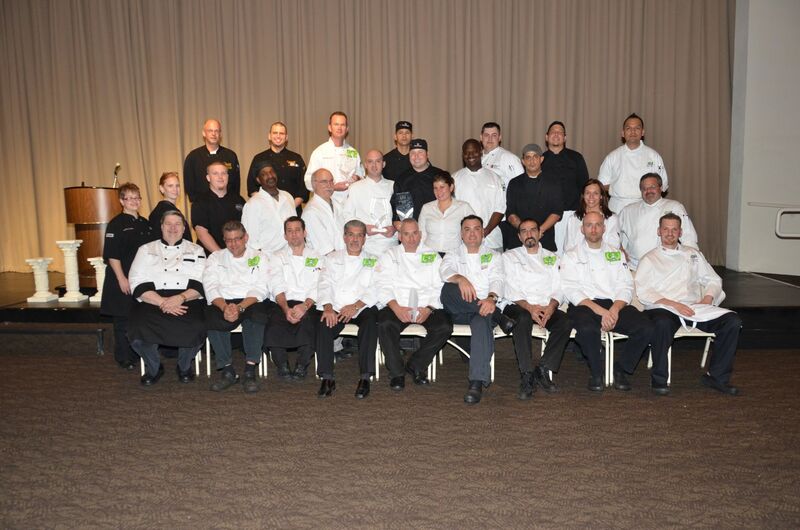 Auction items were generated or donated by participating chefs and their restaurants. The “Top Philanthropic Chef of the Year” award goes to the chef who raises the most money through sponsorships and live auction items. After a girl’s “huddle”, our loyal foursome decided to bid in the Live Auction. We had our eye on the “Dinner for four at your home, prepared by Chef Rene Marquis’ (wines included) and an autographed chef’s jacket from Chef Rene Marquis”. It was valued at $250.00. I won’t tell you how much more we paid, but it was well worth it for this chairity! 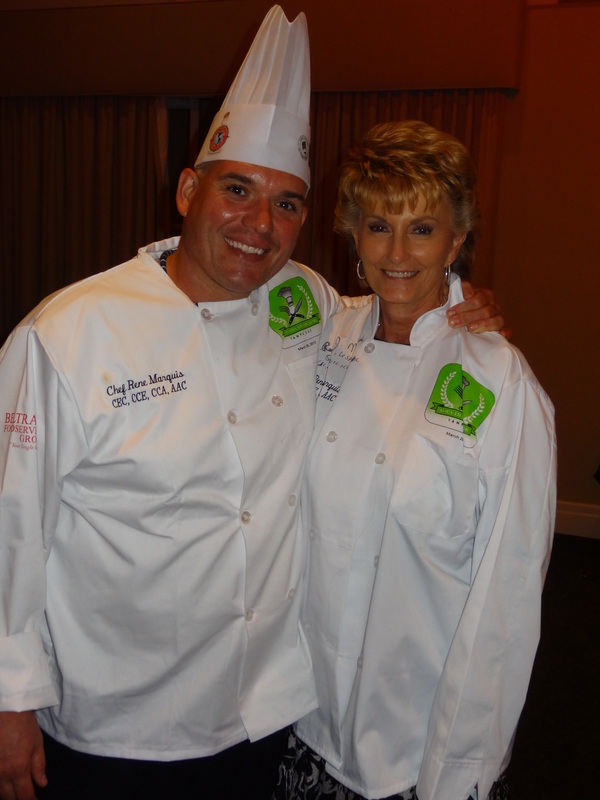 We decided to give Donna the chef’s jacket as she graciously offered to have the dinner at her lovely home. Stylish, contemporary dining is the hallmark of Fleming’s Prime Steakhouse. They also boast some of the finest wines in the world, all available by the glass. 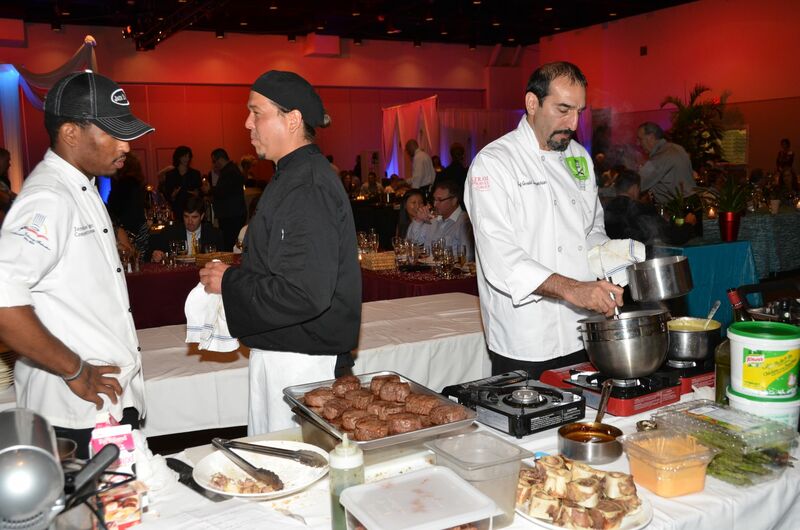 Besides providing an exceptional menu for this event, Chef Mitchell managed to raise an astonishing $6,600+, through sponsorships and live auction items. 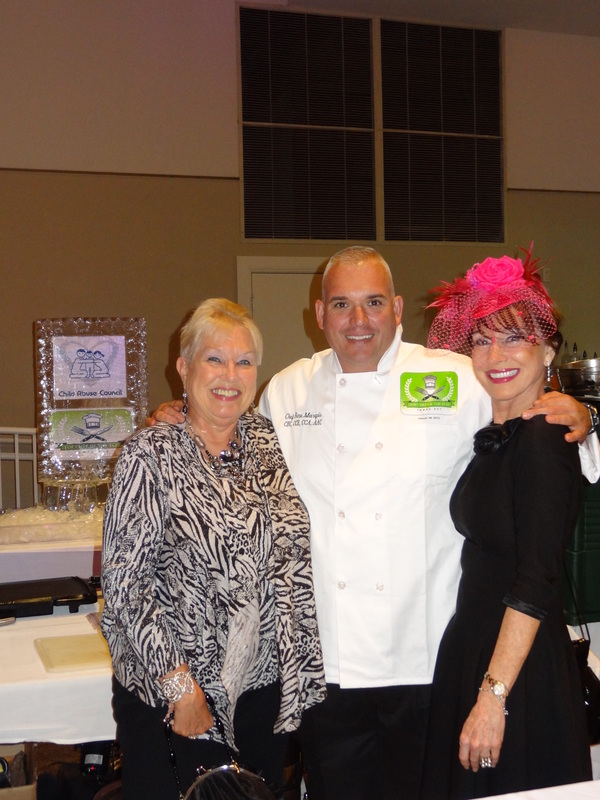 This makes Chef Ryan Mitchell our “Top Philanthropic Chef of the Year Tampa Bay”. Champions for Children appreciates Fleming’s continued support. 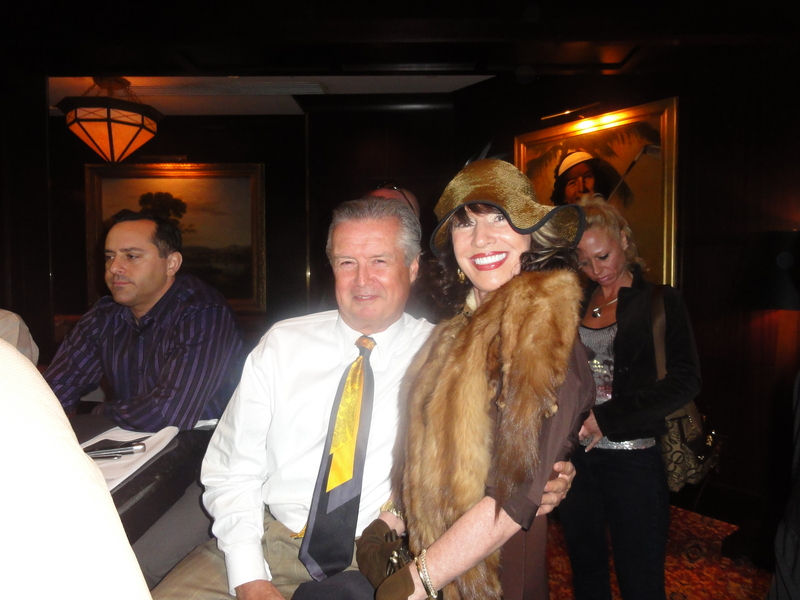 In Fact, Fleming’s will host the Champions for Children Auxiliary’s Martini Party on May 10, 2012. We hope to see you all there! The “Top Chef Of the Year Tampa Bay” award goes to the chef who scores the highest overall average on the courses they prepared for their guests this evening. 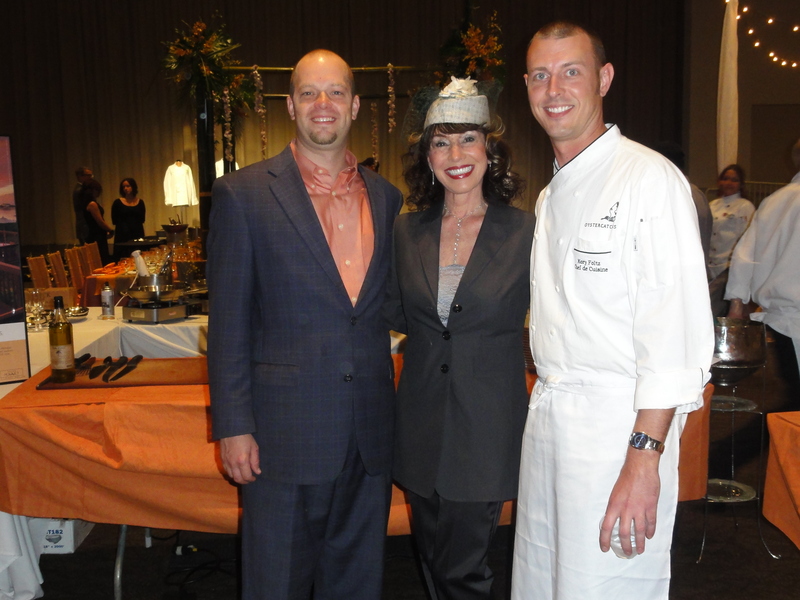 The winning menu was prepared by Chef Rich Mathis from the Tampa Bay Times Forum. Chef Mathis is a Pro Chef II and a Certified Executive Chef and has become proficient in fruit carving and Ice Sculpture. Chef Mathis’s menu included: “Saffron Poached Filet of Chilean Sea Bass”, “Prosciutto and Leek Wrapped Terrine of Veal”, “Confit of Duck, Wild Mushroom Ragout”, “Kobe Beef Tenderloin”, “Lavendar Smoked Diver Scallop”, “Colorado Lamb” and “Creme Brulee Three Ways”. There were accoutrements with each course that one only sees in some of the finest dining restuarants in the world! You can view his complete menu at http://www.topcheftampabay.org. 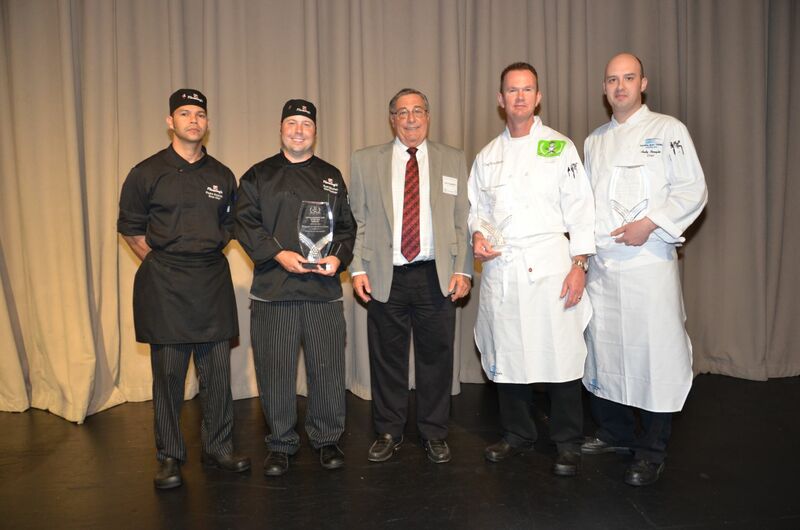 Congratulations to the 2012 Top Chef of the Year Winners! 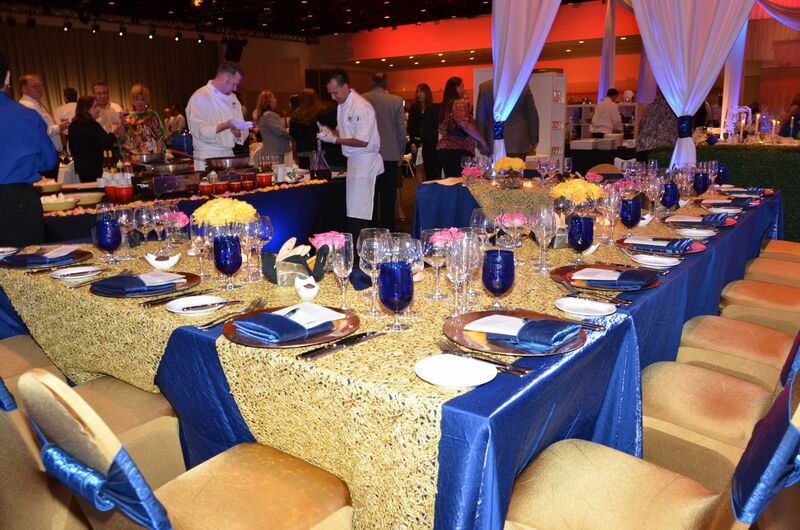 Chef Rich Mathis, Tampa Bay Times Forum, “Top Chef of the Year Tampa Bay” and “Best Table Decor”. 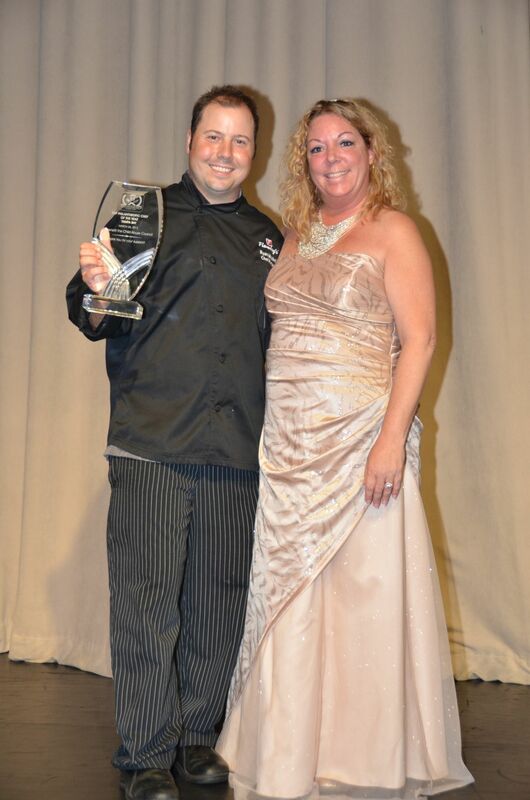 Chef Ryan Mitchell, Fleming’s Prime Steakhouse & Wine Bar, “Top Philanthropic Chef of the Year”. Twelve chefs brought their culinary genius and creative vision to provide an elegant evening of decadent foods and stunning decor for 160 guests. Our thanks go to the following chefs: Chef Andrew Basch of Pelagia Trattoria, Chef Caesar Castro of Publix Greenwise Market, Chef Ben Guggemos of the Hillsborough County School System, Chef Gerard Jamigotchian of L’Eden, Chef Rene Marquis’ of the Special Operations Command at MacDill Air Force Base, Chef Rich Mathis of the Tampa Bay Times Forum, Chef Ryan Mitchell of Fleming’s Prime Steakhouse, Chef Richard Preston of SHOR American Seafood Grill at the Clearwater Hyatt, Chef Parker Stafford of the Blue Water Grill at the Wyndam Tampa Westshore, Chef Mike Von Burg of Armani’s, Chef Dave West of Rolling Pin Kitchen Emporium in Brandon and Chef Keith Williamson of Jackson’s Bistro, Bar & Sushi. 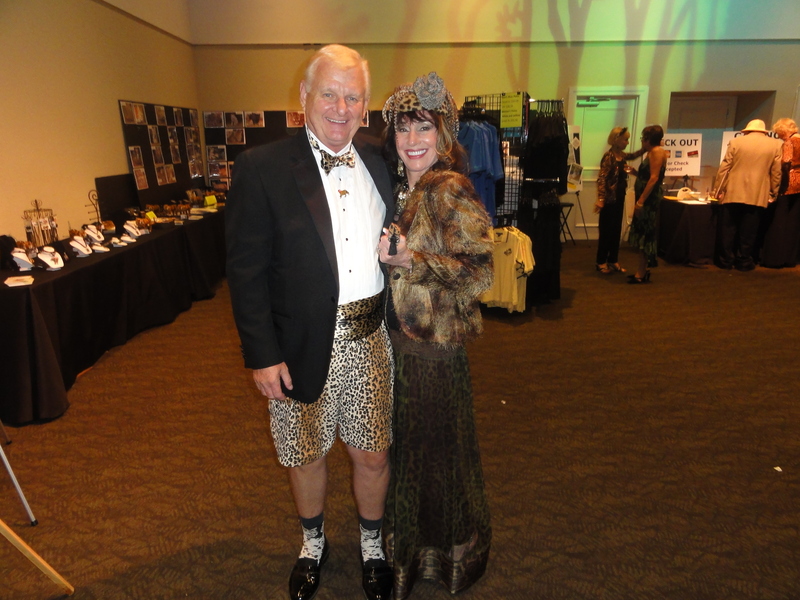 Congratulations to Maria Lewis and Champions for Children (formerly Child Abuse Council) for this impressive and delightful evening, which raised nearly $42,000 to help towards its mission – to serve children and their families through child abuse prevention and family education programs. For me, few things compare to supporting a good cause while wearing a beautiful hat. 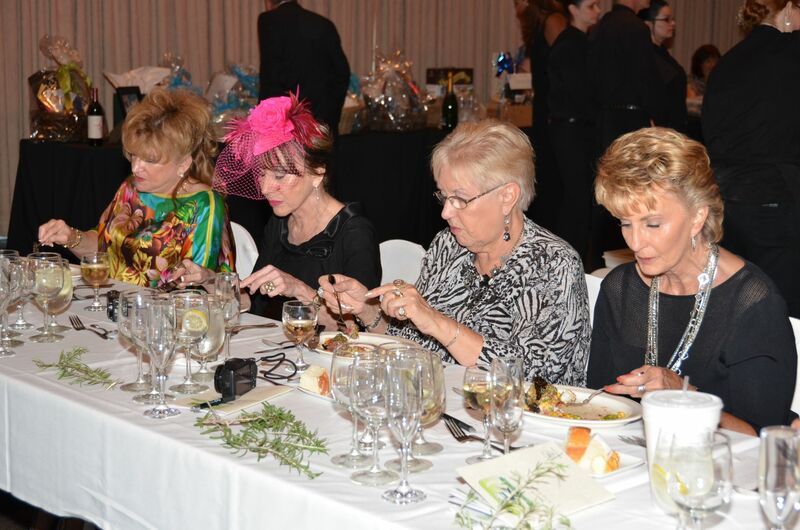 Proceeds from the fifth annual Cup of Hope Tea Party in Tampa will benefit the efforts of Bay Area Legal Services to provide aid to victims of domestic violence. This vital legal aid for victims may include obtaining injunctions against abusers who threaten them, filing for divorce or fighting for custody of their children. 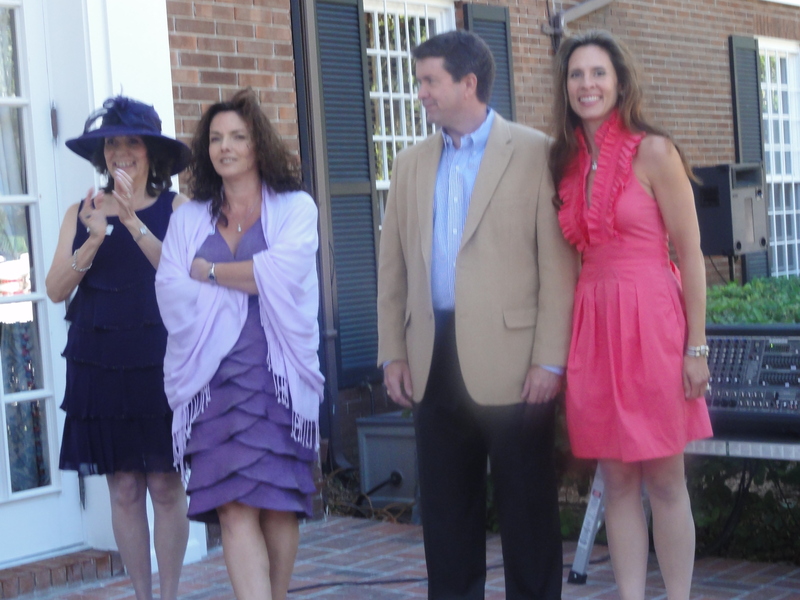 It was one of those beautiful sunny Florida days as we strolled up to the gorgeous home of John and Tracey Bales, who were generously hosting the event. Tea was being served pool-side and I was delighted to find that lovely china cups and saucers were being used. This elegant touch made everyone feel special! 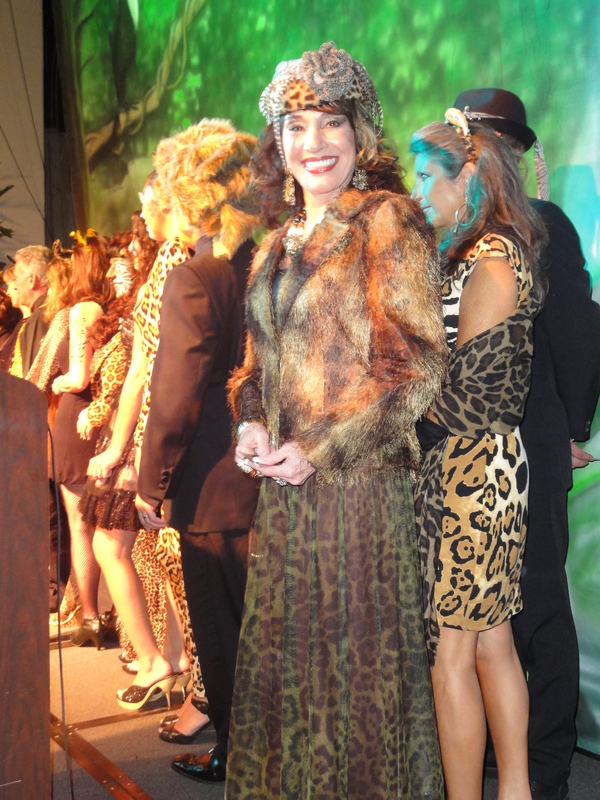 As we sampled the food and wine, beautiful models were showcasing Fashions by Georgette’s Boutique. 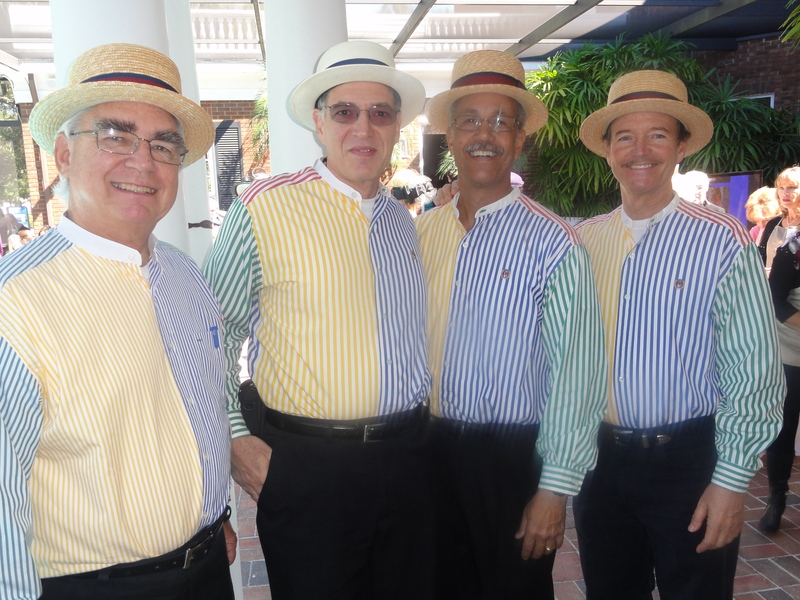 Entertainment included Nelson Mariscal on the Classical Guitar and the Flexible Four Barbershop Quartet. I was astonished when these fine gentlemen proved to me that they knew my favorite song from the 30″s, “I’m Alone Because I Love You”. I was thrilled. It had never happened before! 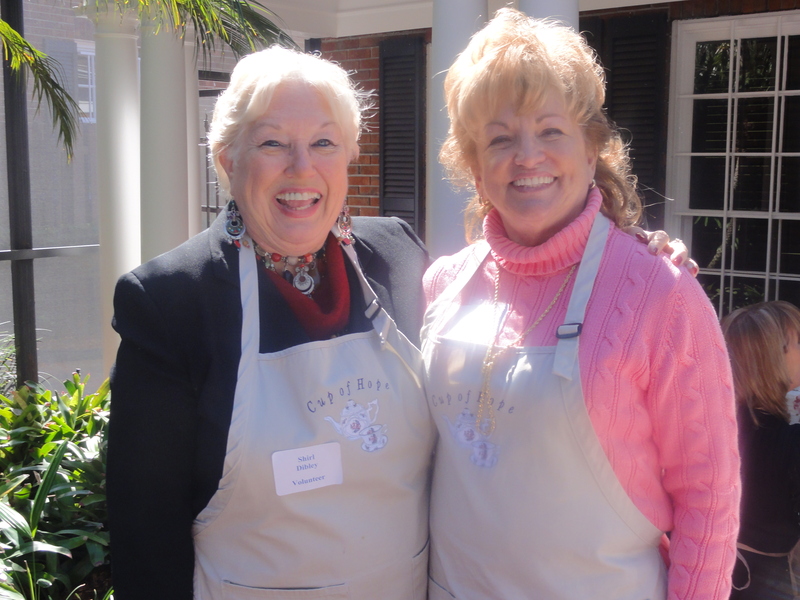 My friends Shirley, Lucy and Carol were among the volunteers serving tea. Normally, I would have been with them but when I hear the words “Hat Contest”, I’m all in! 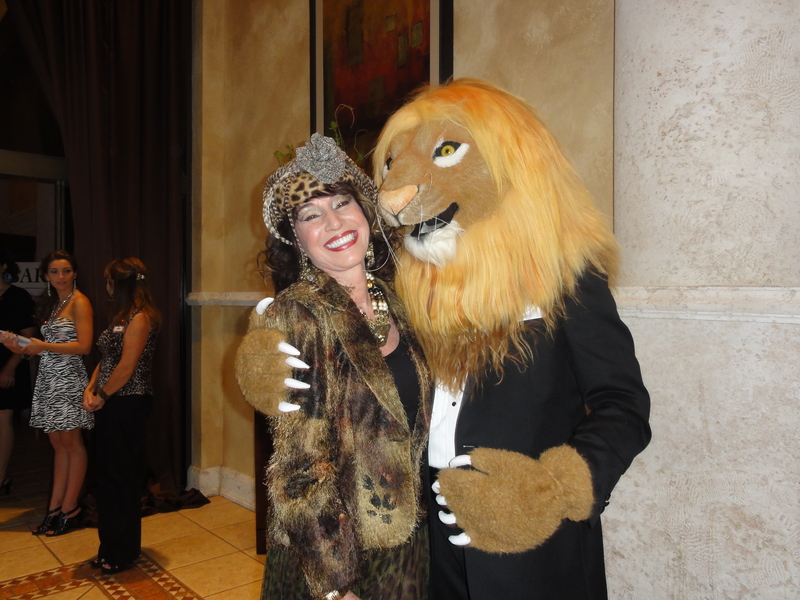 So I attended as a guest and was able to enjoy meeting many interesting and generous people. Chance tickets were available for some great prizes and I enjoyed visiting the booths that were set up on the lawn for shopping. 10% of sales proceeds would be donated to benefit the host organization. Master of Ceremonies for the Afternoon Events was Lissette Campos-Perez of ABC Action News. The Program included a “Spotlight on Survivors” and the presentation of the “Heart of Hope Award” to the very deserving, Yolanda Lee. We were then spellbound by one of the most moving and inspirational stories that I have ever heard. It highlighted the trials and struggles of Patty Parra-Perez, who had suffered for years at the hands of an abusive and dangerous husband. Her bravery and determination to make a new life, after uninmaginable loss, is something that I will never forget. Congratulations to Yolanda Lee and to Patty Parra-Perez, whose honesty leaves me breathless. Soon, it was time for the “Hat Contest”. Believe it or not, it was being judged by real “Judges” from our own Bay Area court system. They did not know about me or My Hat Affair blog, but I would certainly have been embarassed if they were not impressed with my hat. But I thought they did a superb job – as I was a winner! 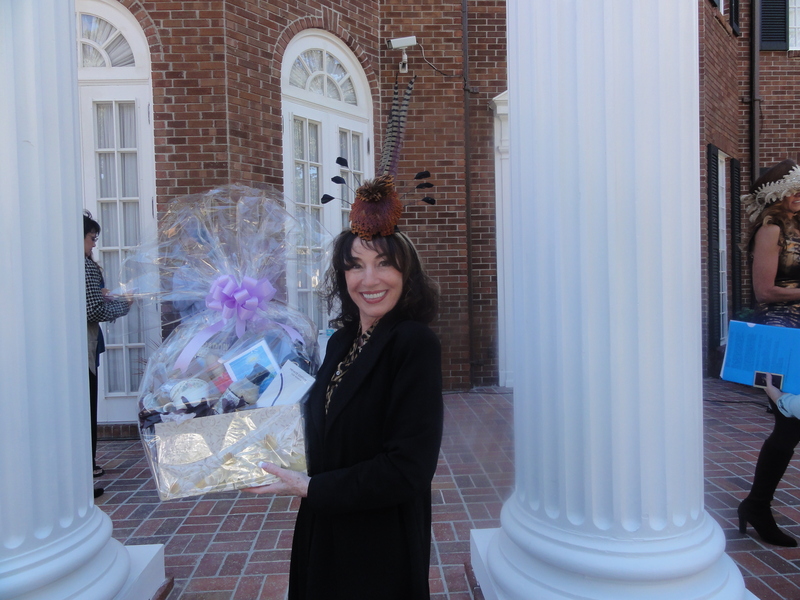 I was presented with a lovely gift basket. I apologize to my readers for posting the blog of this function so late. My computer crashed and I lost pictures and notes and only recently, with the help of a talented friend, was I able to retrieve some of my lost files. Carbonite is now my friend! Please be assured that I whole-heartedly support Bay Area Legal Services in their many efforts to help victims of domestic violence. I was honored to participate in this very special event. 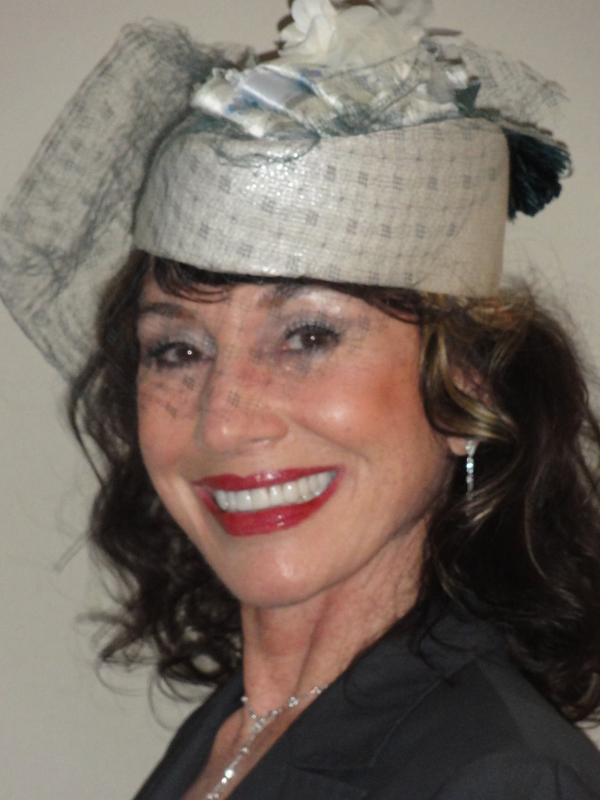 I have been saving this beautiful deco style blue hat with a veil for a special occasion. 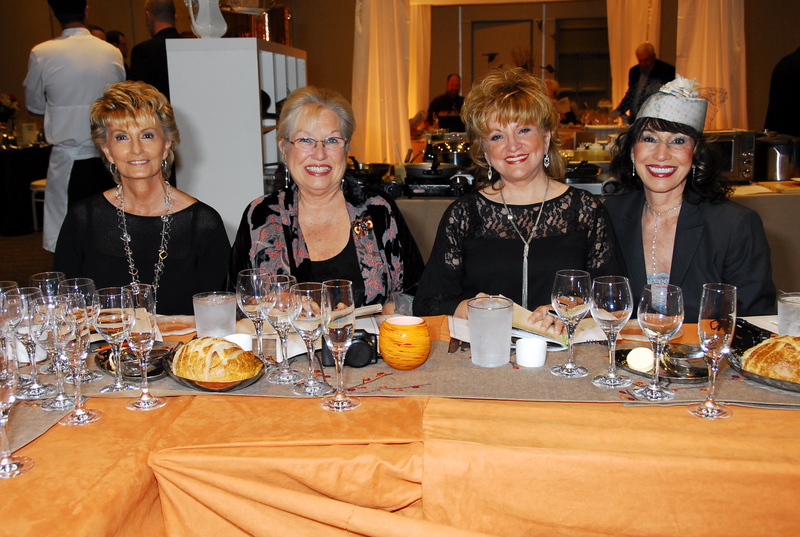 I was very excited when my friend Maria Lewis, Director of Development for The Child Abuse Council, invited us to a one-of-a-kind culinary adventure featuring some of Tampa Bay’s prominent chefs. This event would raise much needed funds for their organization. Eight premier chefs would bring their own ambience and excellence for an evening of very fine dining. 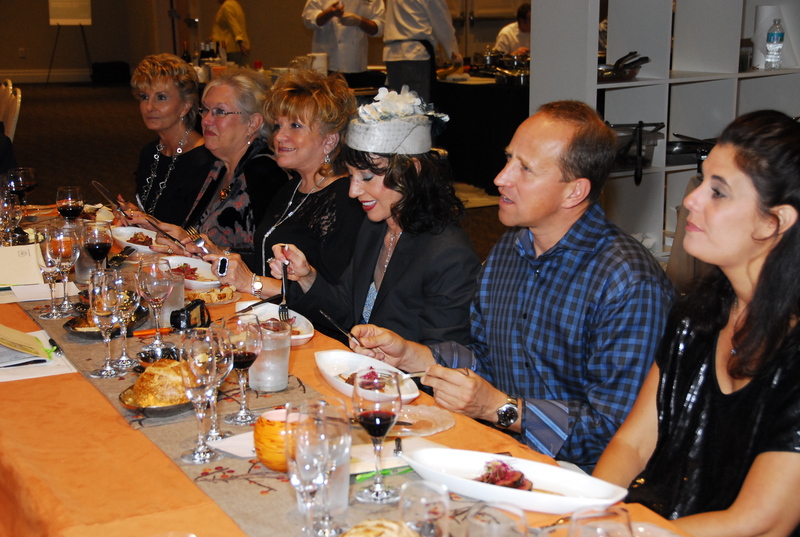 Each chef prepares – tableside – a five course meal with accompaning wine for a table of twelve people. 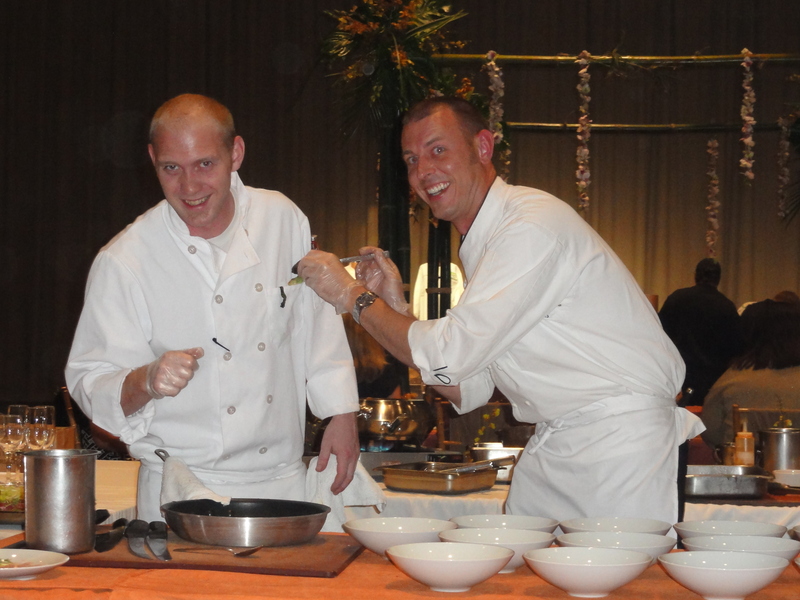 Chefs receive points in an attempt to claim the title of “Top Chef of the Year Tampa Bay”. I was happy when my friends and I were seated at the Oystercatchers table as this is one of my favorite restuarants. Although, I doubt that there was any disappointment as others found themselves at the beautifully decorated tables of Armani’s ( Chef Mike Von Burg), Fleming’s (Chef Ryan Mitchell), Capital Grille (Chef James Shields), Gaspar’s Grotto (Chef s Darlene Herrick & Craig Smith), A La Carte Pavilion (Chef Jim Rice), Blue Water Grille (Chef Kelly Marshall), Palagia Trattoria (Chef Daniel Goldich), and independent Chef Anthony Kelly. 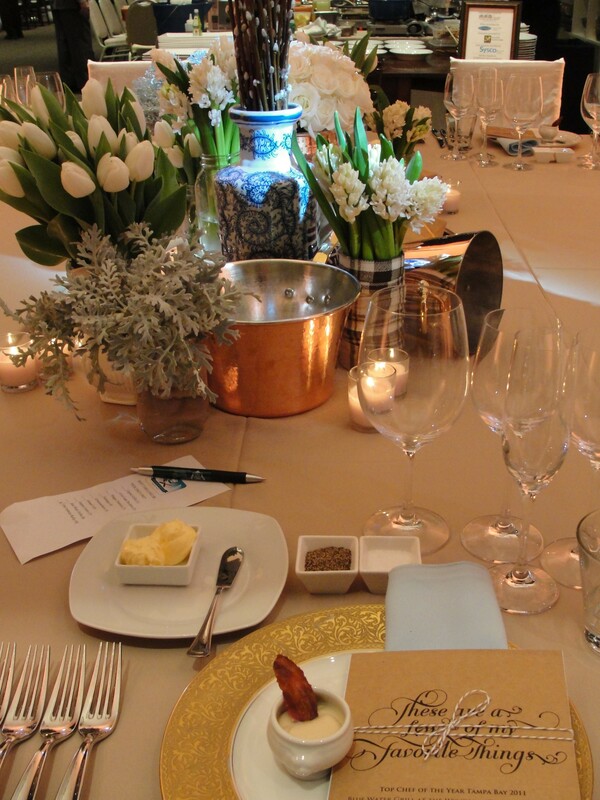 As we wandered the room admiring the gorgeous tables, I couldn’t help but remark on the exquisite place settings. One of the awards tonight would be for best table decor. Each guest could cast a vote and I really had a hard time choosing – they were all so beautiful! Also, as we enjoyed our meal, we would be rating our own chefs in several categories such as pesonality, presentation, menu, wine selection and the taste of each of the five courses. 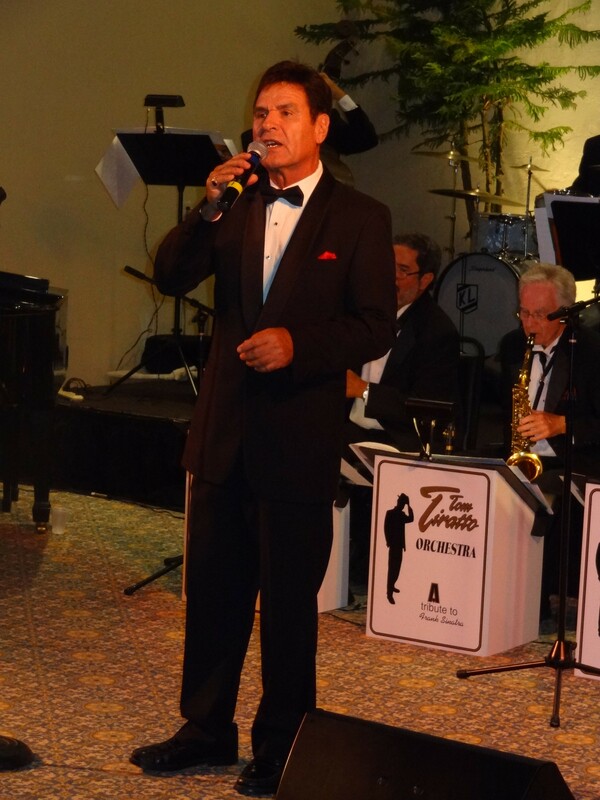 Our Master of Ceremonies was Jack Harris, without a doubt the most popular and most recognized media personality in Tampa Bay. He currently co-hosts the “A.M. Tampa Bay” morning show. 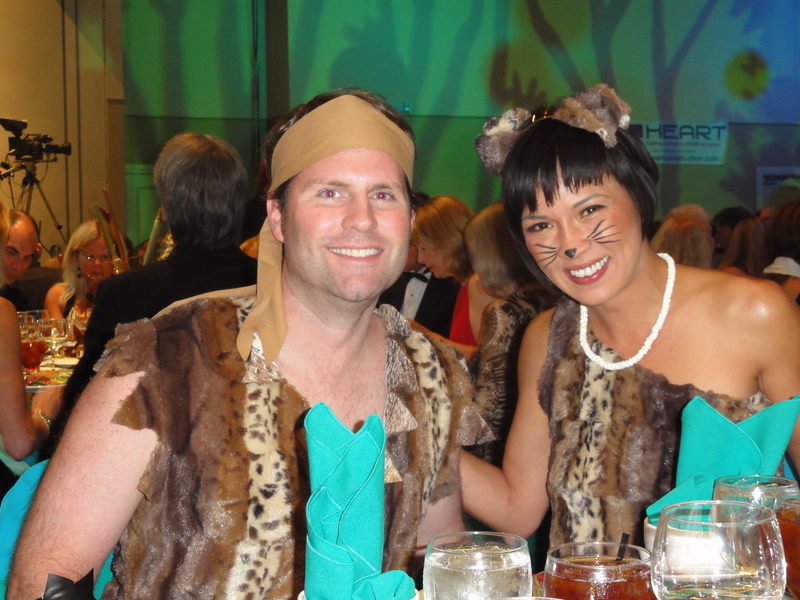 He is engaging and personable and really knows how to squeeze the most out of a live auction! I was pleased to visit with him and tell him about my blog. And, of course, I loved the photo op! This was no “Kitchen Nightmare”. These chefs prepared scrumptious dishes tableside that looked and tasted like those from any five-star restaurant! I got up several times to check out the other menus and found unbelievable courses, e.g. “Oysters menage ‘a trois” (Gaspar’s Grotto), “Bronzino Saltimboca” (Armani’s), “Anise Butter Braised Sablefish” (Blue Water Grille), “Mint & Sage Marinated Lamb Tenderloin” (A La Carte Pavilion), “Browned Butter Pistachio Tart” (Fleming’s), “Alaskan King Crab Salad” (Capital Grille), “Fennel Crusted Scallops” (Chef Kelly) and “Veal & Spinach Ravioli” (Pelagia Trattoria). I have to admit that I was partial to our Oystercatchers chefs and their menu. They were adorable and entertaining. And most importantly – generous with the wine! I loved our “Kobe Beef Strip Loin” which they served with “The Prisoner”, a blended red wine that was delicious. And, the “Deconstructed Key Lime Pie” was served with Moet & Chandon Nectar Imperial. Chef Kory Foltz was definitely out to impress! 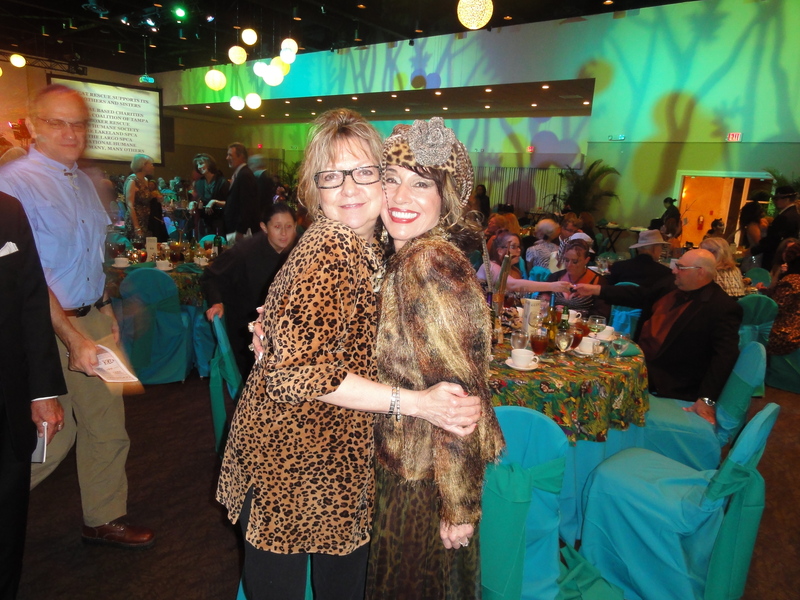 During the live auction, my friend Lucy bid on and won a 4-day/3-night stay at the Brown Palace Hotel in Denver, Colorado plus breakfast and signature massages. Immediately, Shirley said “I’ve got the airline passes”, Donna said “I’ve got the locale experience” and I said “I’ve got the ski clothes”. We can only hope that she will somehow pack up all three of us for the trip!! 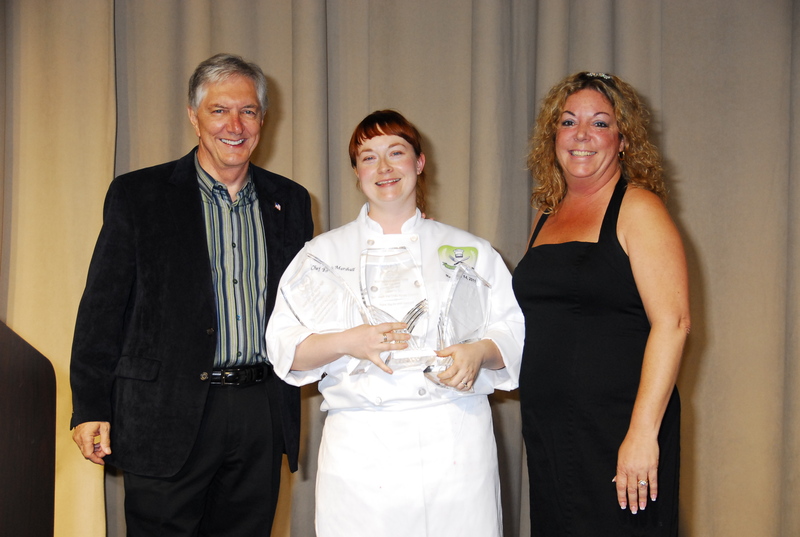 When the points were counted for all categories, it was a dazzling victory for Chef Kelly Marshall of Wyndam’s Blue Water Grille. She wins “Best Decor” for accessories and menu based on the song, “My Favorite Things”, from “The Sound of Music”. And Kelly claims the title of “Top Chef of the Year Tampa Bay”. She also wins the esteemed title of “Top Philanthropic Chef of the Year”, which is awarded to the chef who raises the most money in donations/sponsorships prior to the event and with their live auction item. So, congratulations to Chef Kelly Marshall, our “triple crown” winner! 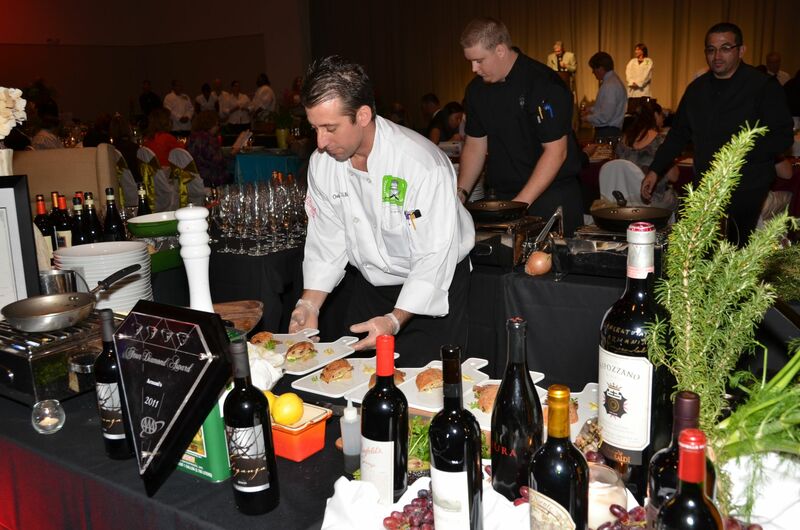 With the overwhelming appeal of famous television shows featuring outstanding chefs who have been praised for their culinary genius, this wonderful event has definitely put our own accomplished Tampa Bay chefs in the limelight. My friends and I have already made reservations at some of their restaurants. 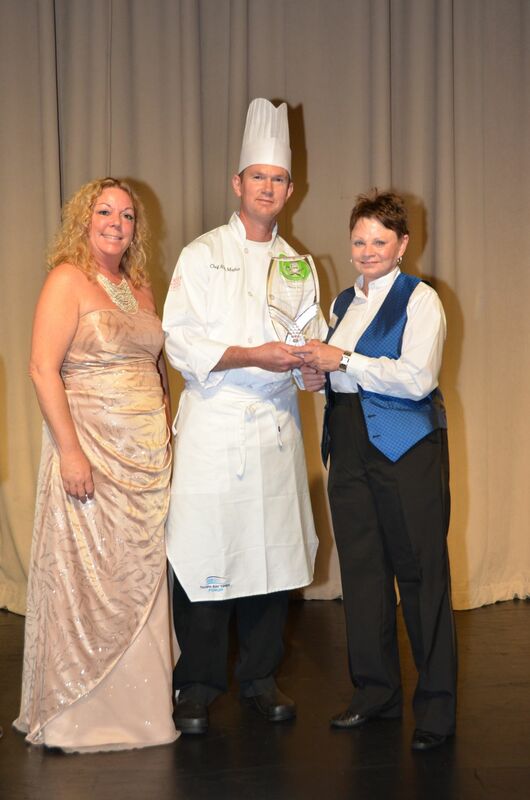 We will surely participate again next year to see who will earn the honor of being called “Top Chef Tampa Bay”. 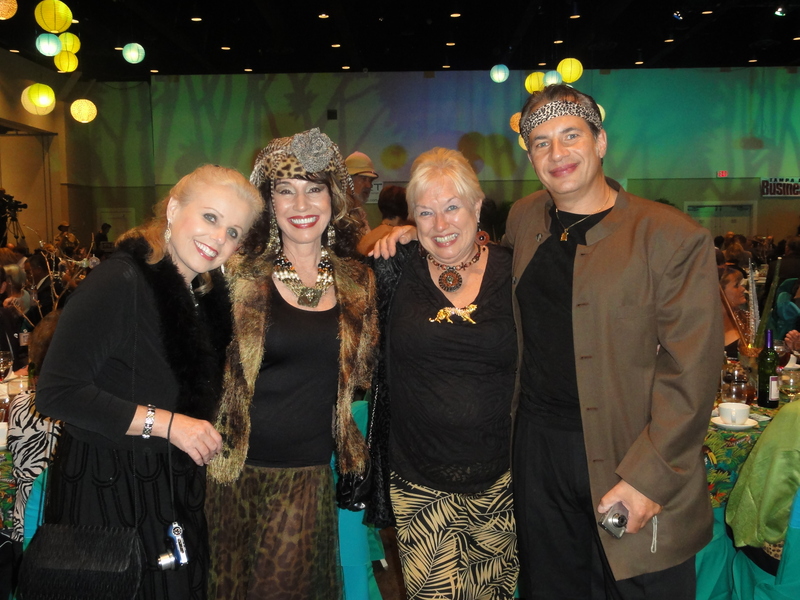 Congratulations to Maria Lewis and The Child Abuse Council of Tampa Bay for this impressive and delightful evening, which raised $26,650.00 to help towards its mission – to build stronger families through child abuse prevention and family education programs. I’ve been told that I have “the gypsy in me” – probably from my Hungarian ancestors. Fortunately, several of my friends have the same wanderlust, so we found ourselves planning a trip to Paris for Christmas. 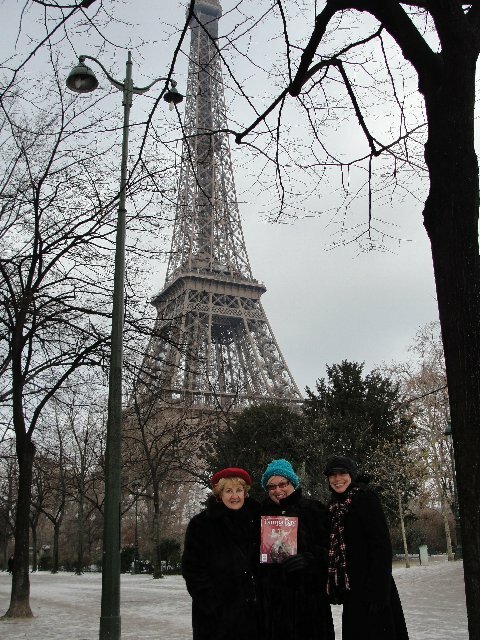 Having a friend who is a former airline employee made “buddy passes” and first class flights a reality for four gal pals longing to see the City of Light (on a budget). 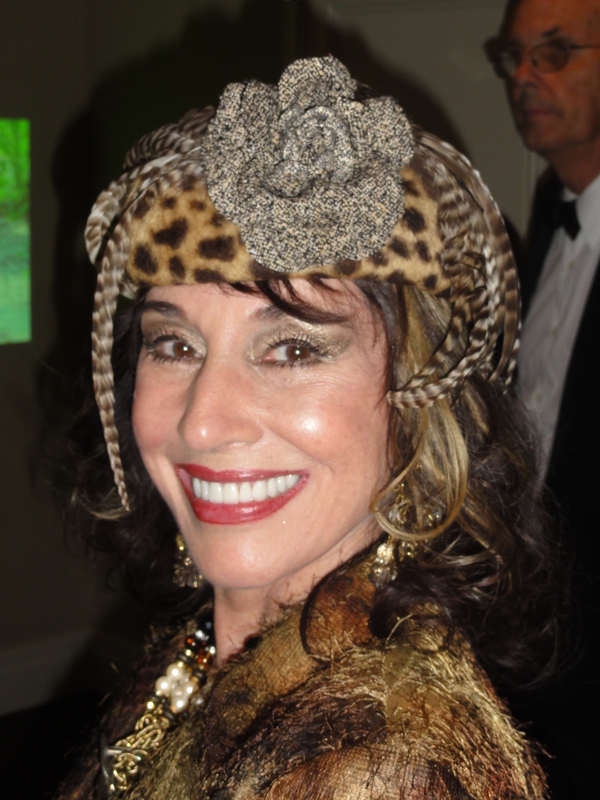 Never one to go hatless to a party, I brought berets for all to Shirley’s Pre-Paris cocktail party. 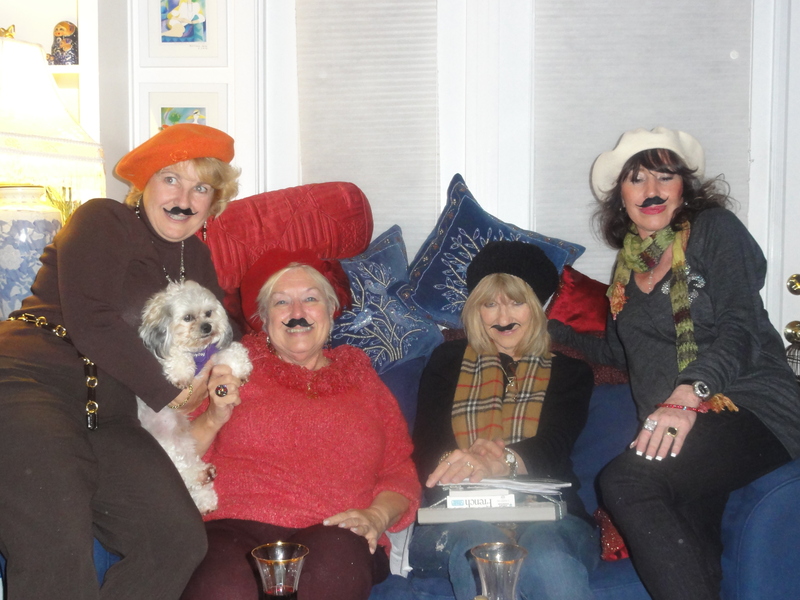 French bread, wine and mustaches made excellent accessories as we met to hash out the details of accomodations and itineraries. Shirley’s dog, Vivo, insisted on posing with us. I wasn’t looking forward to our all-day wait at the Charlotte airport but that’s when having a friend like Lucy is downright amazing. She got us into the U.S. Air First Class Lounge! 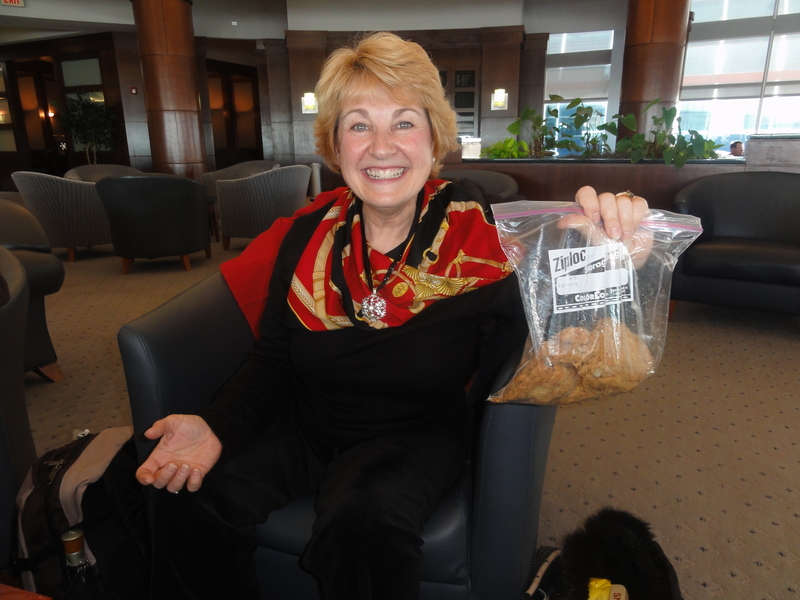 We had all stocked our bags with little snacks but Renate pulled a bag of fried chicken right out of her purse. Now there’s a girl who knows the meaning of “discount dining”! While our overnight first class flight was heavenly, the trek to our rented apartment in the 17th Arondissment was hell! Dragging suitcases and backpacks on two trains, two metro liners and several street blocks nearly did us in. Oh, and by the way, it was 26 degrees outside! But who cares. It was Christmas Day. And it was Paris. 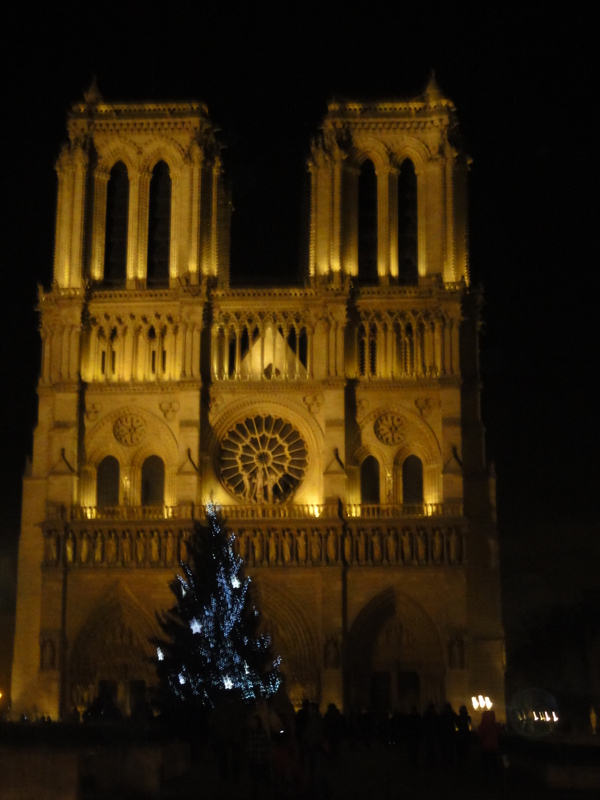 Thankful for our safe arrival, we decided to make a Christmas evening visit to a sacred destination – Notre Dame Cathedral. This is the most popular monument in Paris – famous for its French Gothic Architecture, Romanesque sculpture and medieval stained glass windows. We walked in to a beautiful Christmas service complete with incense and chanting. As a good Catholic girl (kindergarden through college), I was overwhelmed with memories of other Priests, altars, choirs and candles – different and yet somehow the same. Yes, I am very comfortable with my regular doses of guilt and fear! The next morning we headed out to see The Eiffel Tower. This engineering masterpiece of iron has stood there since being built as the entrance arch to the 1889 World’s Fair. It is not surprizing that this amazing tower is France’s most recognizable structure. Hoping to get our picture in Tampa Bay Magazine, we posed with a copy in front of the tower. If it weren’t so cold, you might have recognized our faces under the hats and scarfs. Oh well, at least there were hats! A freezing open bus tour convinced us that we deserved at least one special lunch. Seated in a cozy cafe, Lucy noticed a handsome stranger “across a crowded room”. Michael was vacationing from his job at Paramount in California. He was charming, intelligent and funny and it didn’t take long to make him our “new best friend”. 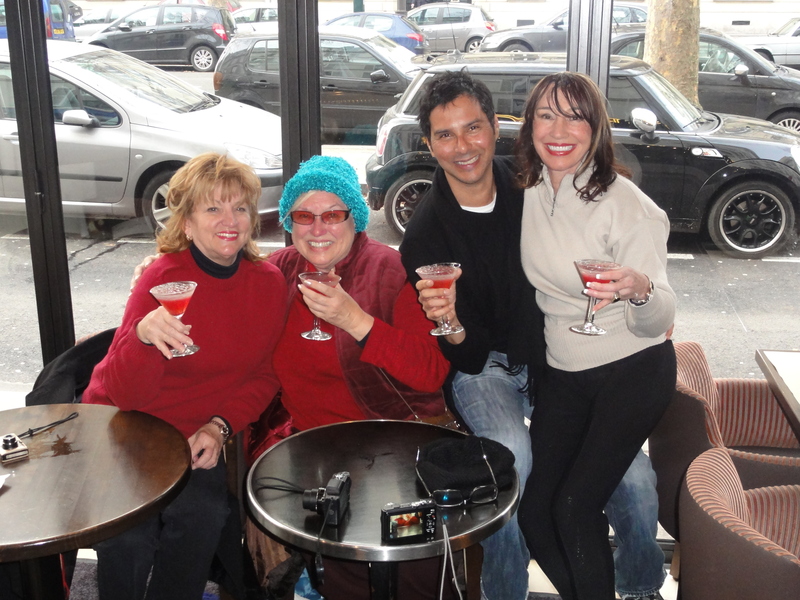 We walked to a nearby bar for conversation and Cosmopolitans. Lots of laughter later, we were already planning his visit to Tampa. And Michael graciously picked up the check! I happen to love Opera! 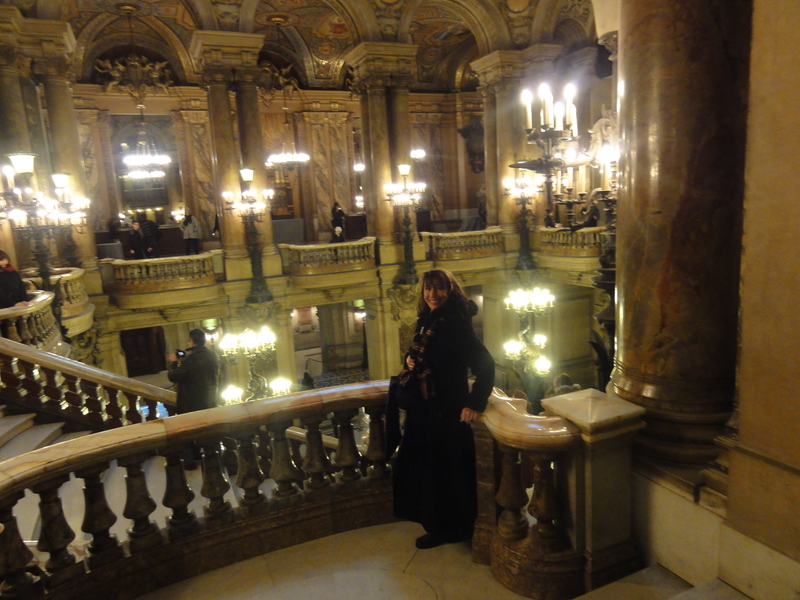 So, for me, the highlight of our next day was a visit to the Opera de Paris, a grand building designed in the “Baroque Revival” style. The theatre is decorated opulently with elaborate marble friezes, columns and lavish statuary. It is rich with red velvet, gold leaf, cherubs and nymphs. Imagine what it is like to weave through the sumptuous corridors, stairwells, alcoves and landings, socializing with other patrons during intermission. I’m sure that I would feel like “Pretty Woman”! The following day was devoted almost entirely to the most visited art museum in the world, the Louvre. We made a valliant attempt to view the more than 380,000 objects and 35,000 works of art. Perusing the paintings, we were nearly trampled to death trying to get a picture of the Mona Lisa! 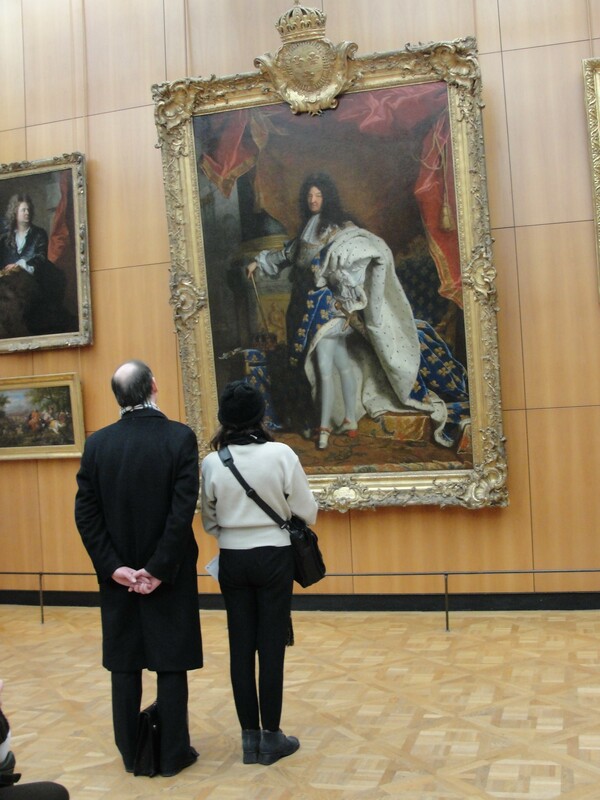 One gentleman appeared to have an obsessive devotion to a painting of the French King, Louis XIV. After waiting for more than an hour, I deliberately stood very close to him in front of the painting. He was definitely annoyed. Shirley and Lucy were cracking up behind us! The rest of our week flew by. We had so many museums, galleries, churches and historic monuments on our list that we literally dragged ourselves back to our apartment each evening – stopping only for our loaf of french bread and bottle of wine. It was a party every night! We laughed as we reviewed the day’s events. Lucy had encountered a “pick-pocket” at The Basilica of The Sacred Heart. We had arrived at the O’Chateau Wine Tasting with – “oops” – no reservation! They seated us in the back like petulant children but we were just grateful to be tasting the wonderful French wines. Paris is fabulous by day, but unforgettable by night! 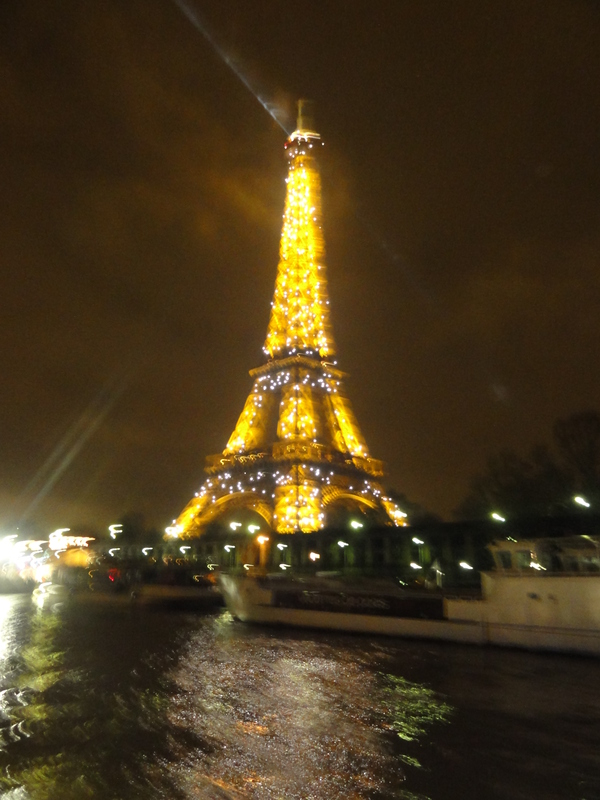 On the last evening, we took the boat ride down the River Seine where we had a beautiful view of the Eiffel Tower with its brilliant lights. It was magical. Staring wistfully at the stunning sight, we could hardly believe that our trip was coming to an end. 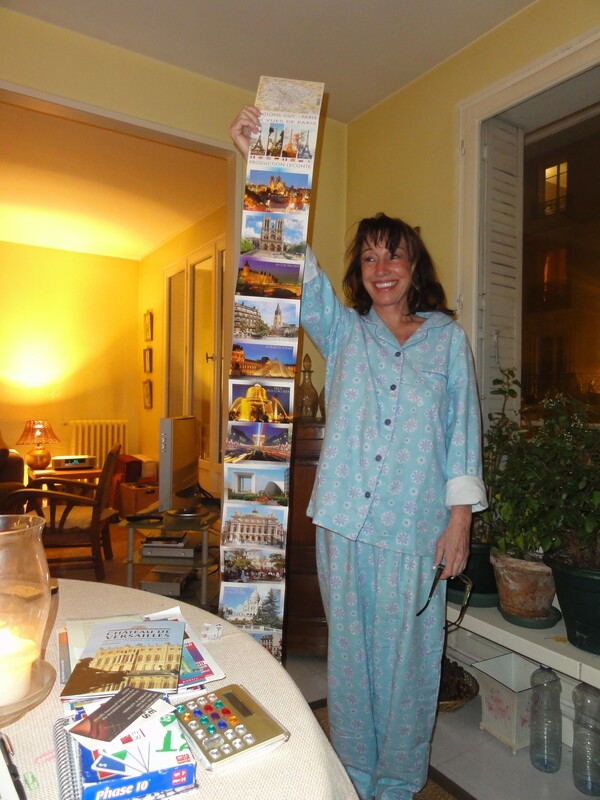 We had experienced the joy of unlimited sightseeing with our “Paris Pass”. We had seen the grandeur of some of the world’s most spectacular and enduring architectural styles. And we had sealed our friendship forever because – “We’ll always have Paris”! 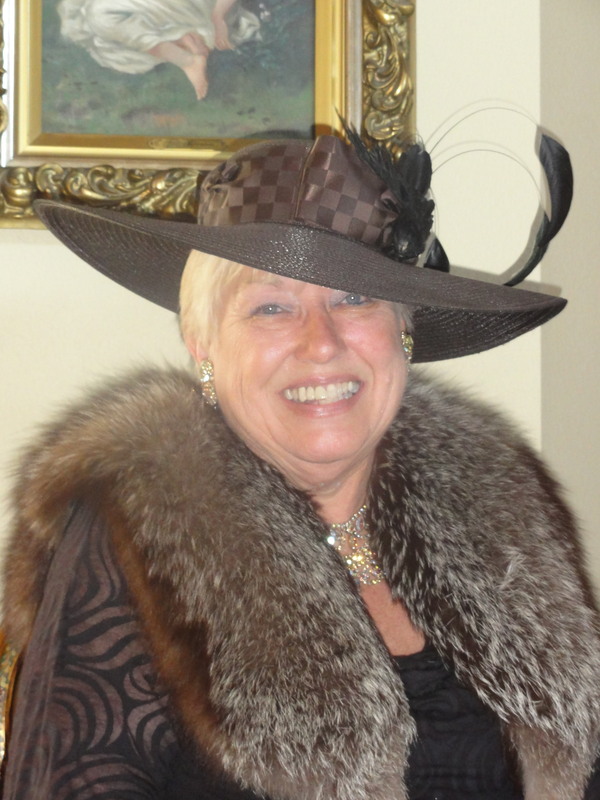 Normally I would end My Hat Affair blog with a comment about what was “on my head”. But upon arriving home, I was so exhausted that I slept like the dead for three days. 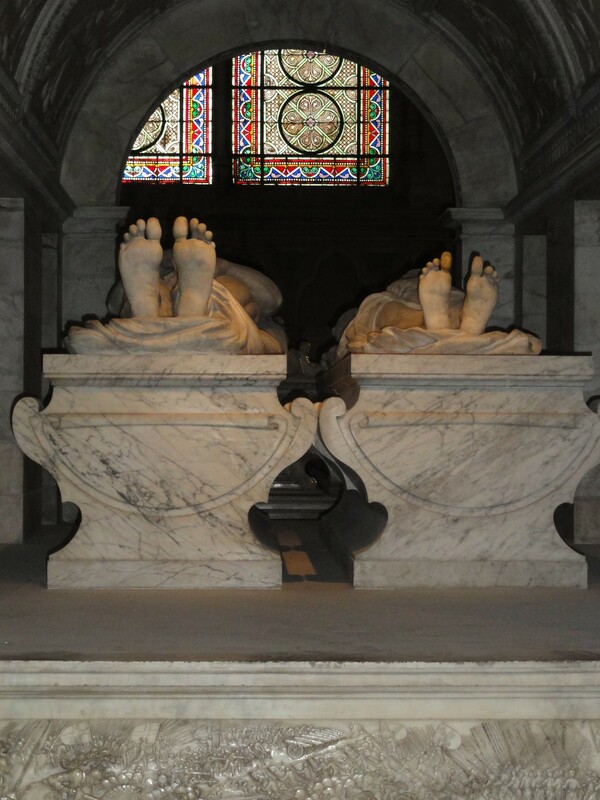 It made me think of those Kings of France and their families who, for centuries, were buried at the beautiful Basilica of St. Denis. I was struck by the cold, stone effigies on their tombs. All I can say is that, if anyone had wanted me to leave my house, it would have to have been “feet first”! If you are following my blog, you know by now that I have been collecting hats for many years. 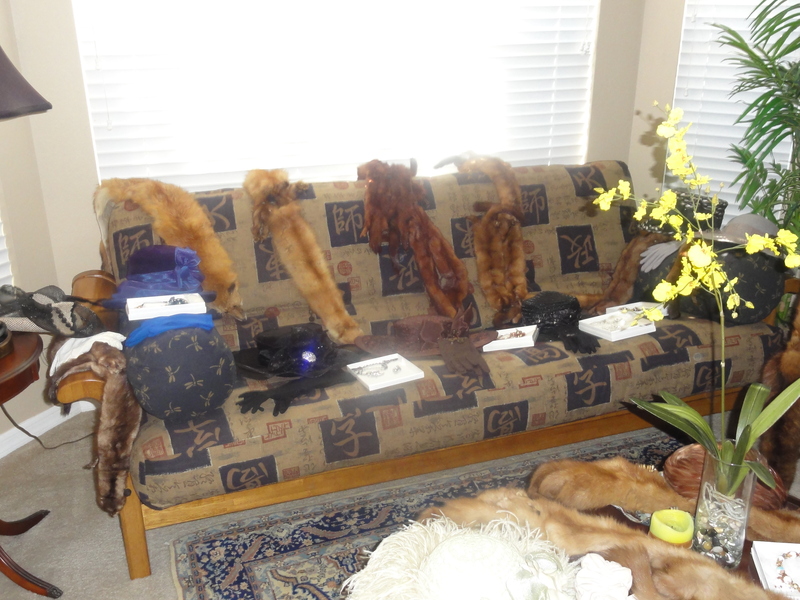 Along the way, I picked up some vintage fox fur stoles that were very popular in the 30’s and 40’s. 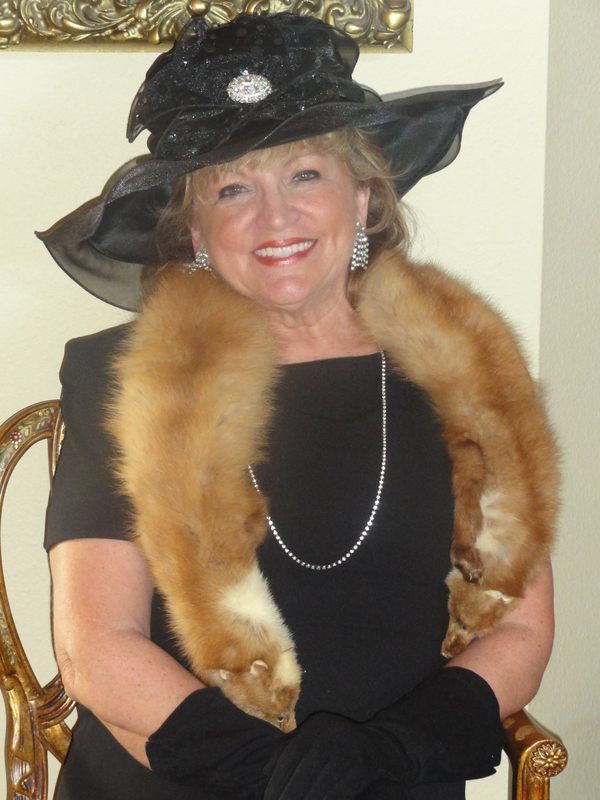 I’m also fond of vintage gloves and I have an extensive collection of costume jewelry. 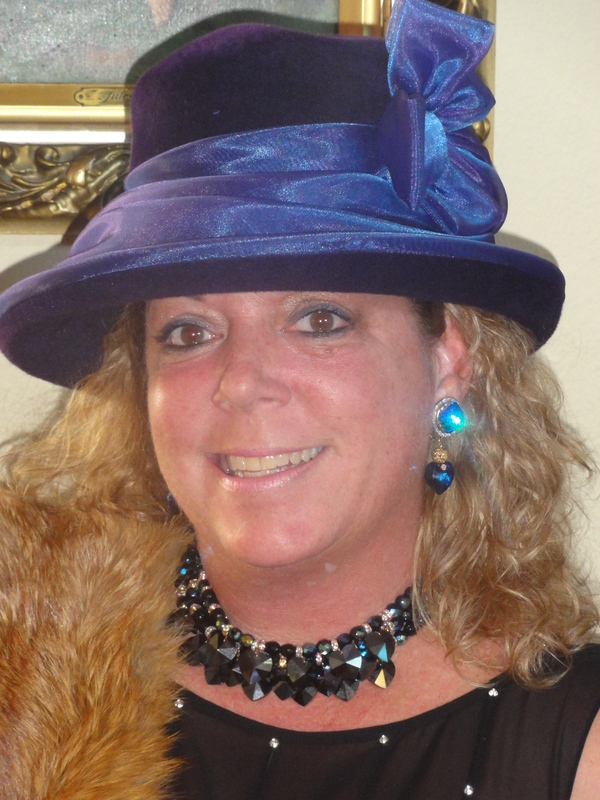 It takes some time to prepare for this type of hat party but it is worth every effort. The “cocktail hour”. the “dress up” period, the “picture-taking” and the ultimate “restaurant revelation” makes everyone feel happy, special and very glamorous! It makes for a real “Somewhere In Time” evening. One of my favorite parts of the preparation process is getting out the beautiful “Rosepoint” crystal champagne glasses and plates that my mother left to me. 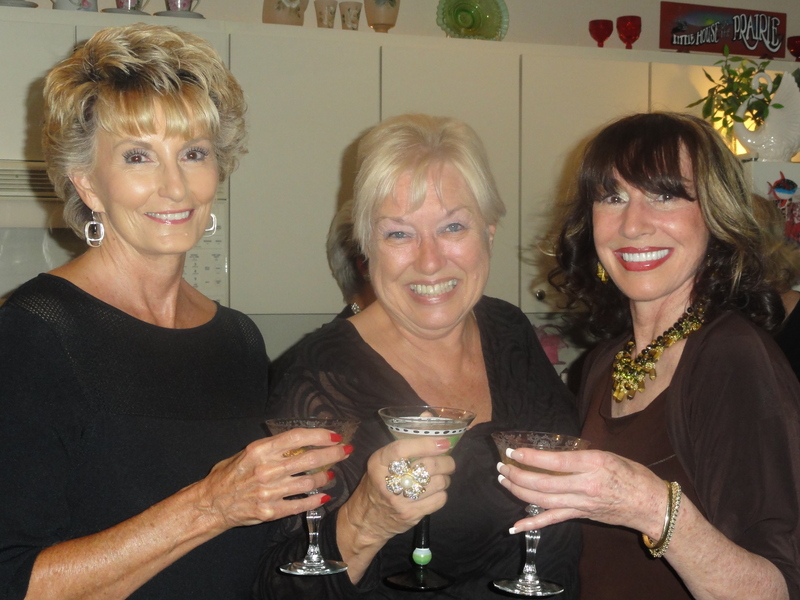 Shirley is having a Martini but Donna and I are enjoying the “old fashioned” way of sipping our champagne in these beautiful cut crystal glasses! 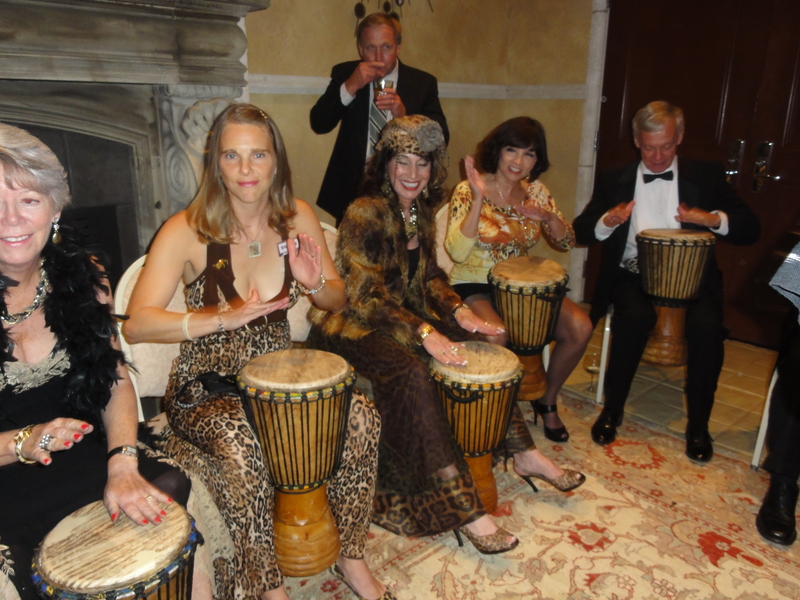 As this is a “theme” party, the invitations included certain “rules” for those who participated. I asked them to wear a simple dark outfit e.g. black, brown, navy. 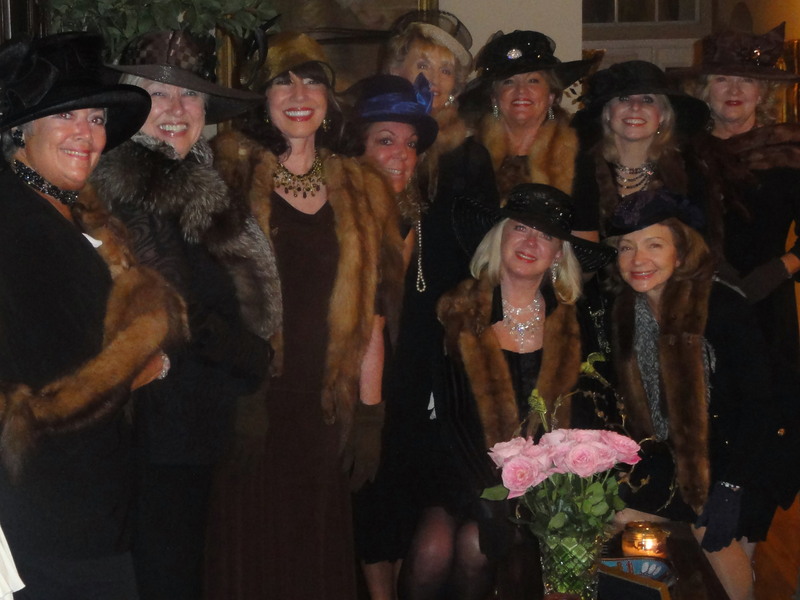 This would assure that the hats, furs, gloves and jewelry would be showcased and give the ensemble that “vintage” look. My friends were only too happy to oblige. During the second hour of the party, each of my friends went to the “sitting room” to choose an ensemble. I was very pleased that each one of them found something that was, not only beautiful, but flattering to their hair and eye color. 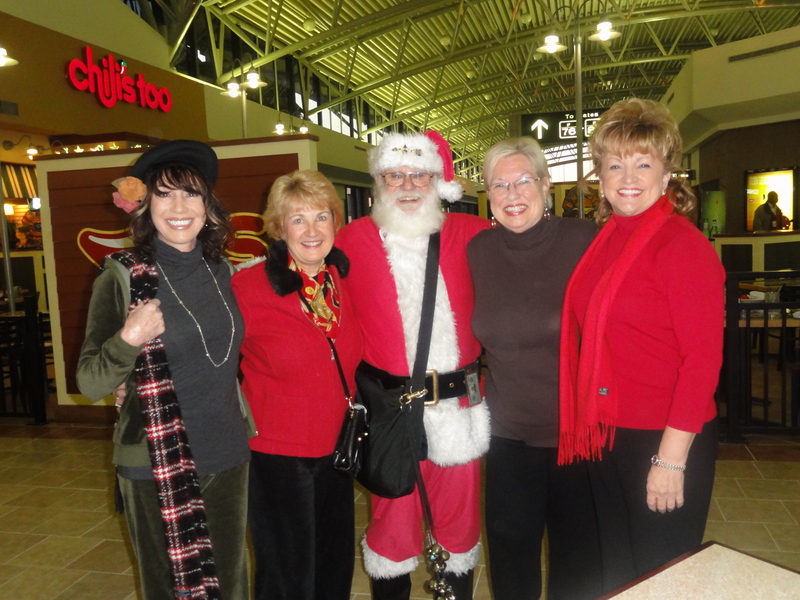 And, of course, I helped choose the hat that was just right for each one! 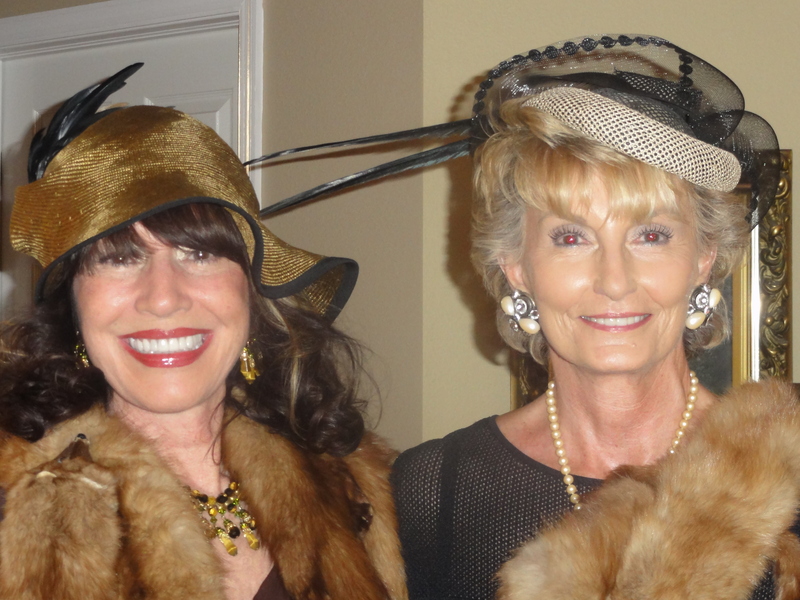 I gave my friend Judy a “high” black hat that I bought at Harrods in England. 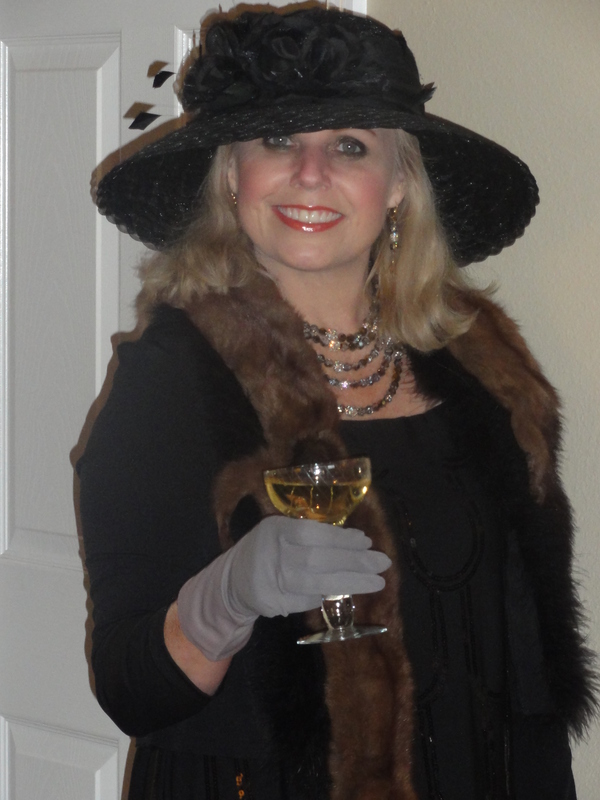 Carol wore a gorgeous black hat with sparkles that complimented her crystal jewelry. 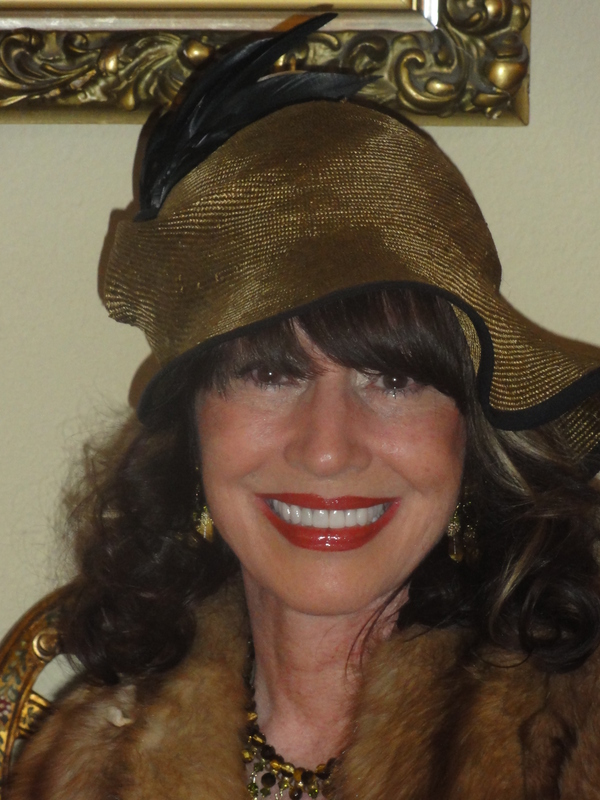 Patsy was adorned in a beautiful brown hat with a large bow. 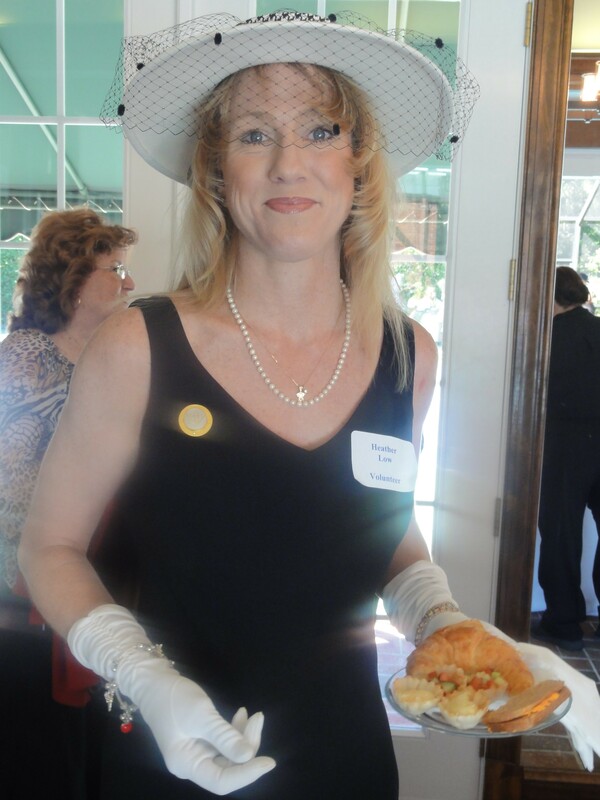 Barb was in a small navy decorative hat angled on her head. 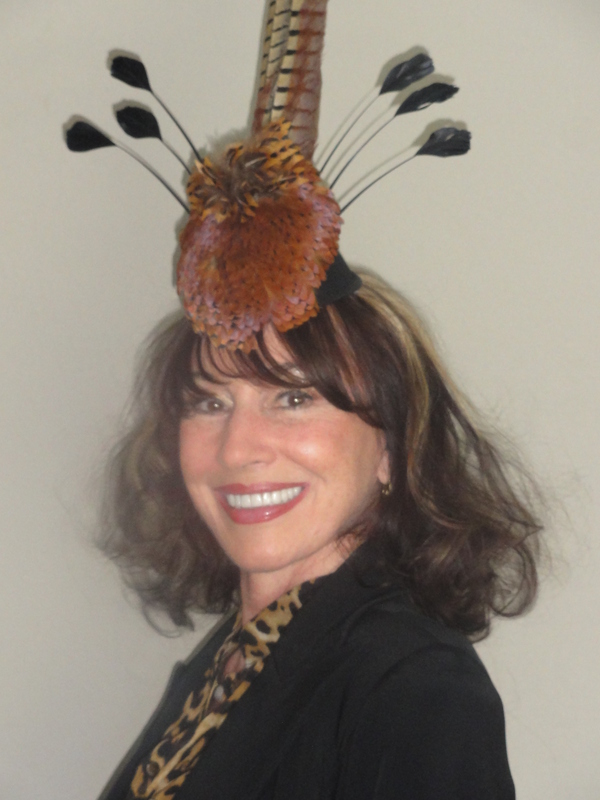 My own hat, made by a milliner in Oregon, is one of my most stunning chapeaus! As there were ten of us, I am selecting a few close-ups, but I hope you will notice in the group shots how perfectly the girls chose their individual looks. What can I say, my friends have very good taste. We had an hour after dressing to enjoy more champagne and hors d’oeuvres and take some wonderful photos. I was thrilled that the girls were having so much fun and really “getting into character” for this night. 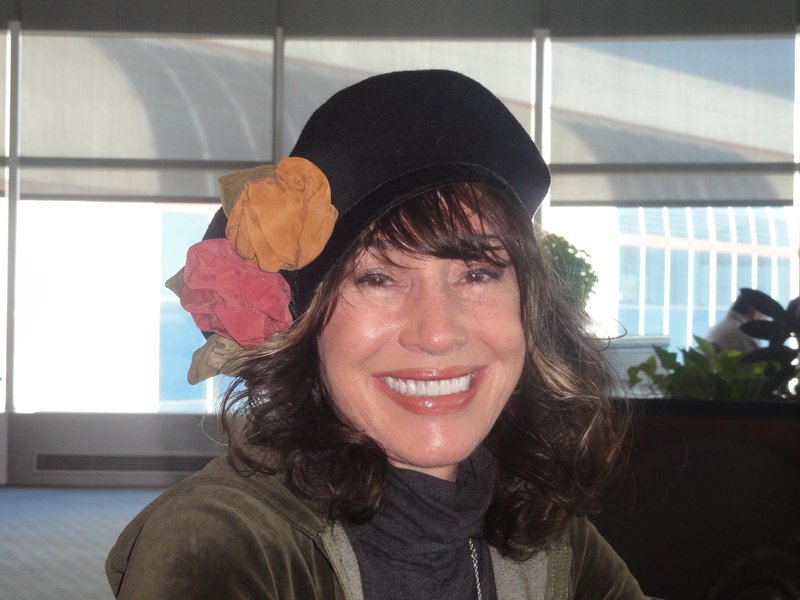 I really loved the hat that Donna chose. It suited her personality perfectly. She is a very elegant lady with a lot of poise and as she sat in her chair she reminded me of Grace Kelly. 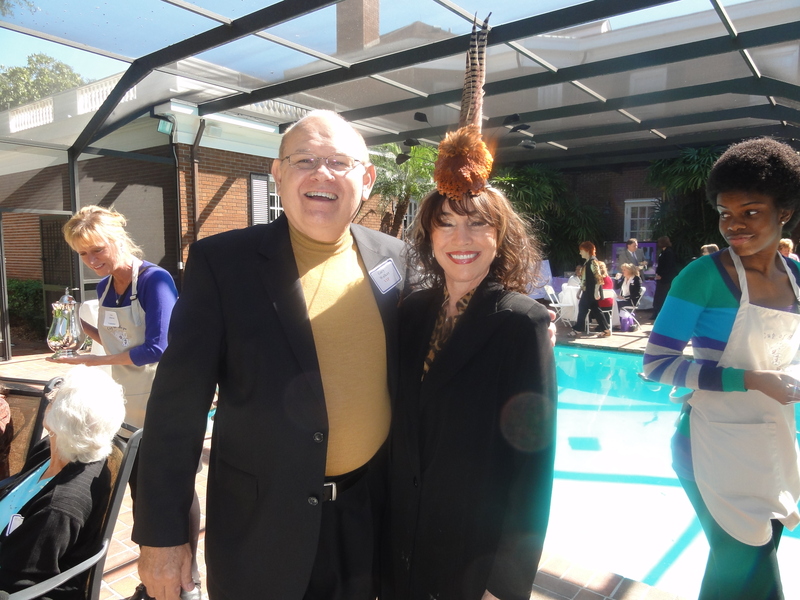 I have had that hat for many years and, believe me, it is tough to store with those long feathers! It looked beautiful on her. I know that you are going to enjoy “the rest of the story”. Naturally, I wanted us to be visible in our beautiful and unique attire. I had made a reservation at an upscale restuarant that is very popular and I knew it would probably be crowded on a Friday night. We arrived a little early and decided to wait at the bar. Obviously, there was not room for ten ladies at the crowded bar. That was when I met the handsome, and very “dapper” Phil. After laughing and suggesting that we were certainly not a PETA convention, he offered to buy two bottles of Veuve Clicquot Champagne. 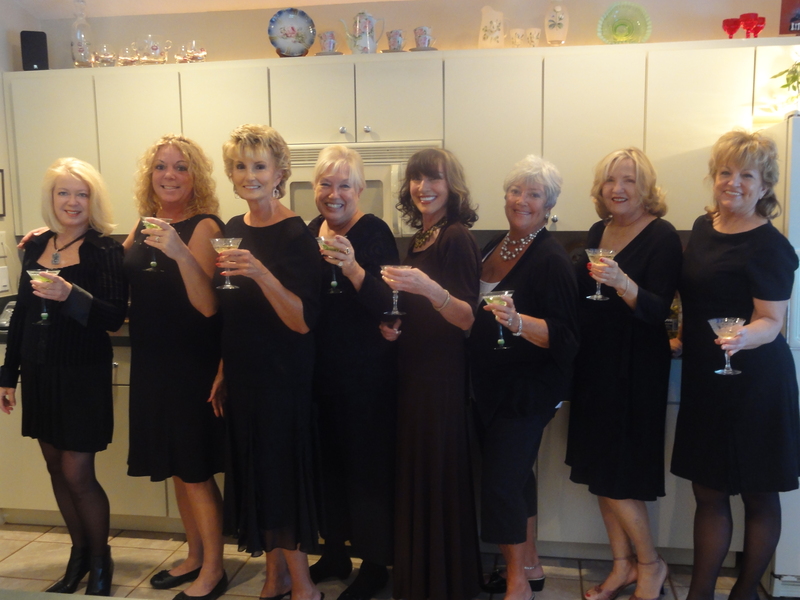 Soon we were passing flutes of champagne amongst the girls. Thanks Phil, you are very generous. After being seated at our table, we continued the chatting and laughter and thoroughly enjoyed our meal. People were coming over to the table to ask about our event. I was astonished when a woman at a table next to us turned out to be a member of my high school graduating class. It was quite the coincidence. Several people were trying on our hats. The end of the evening proved to be quite the “brouhaha” because someone had cancelled my ride home and some of us were stranded. Oh well, Phil to the rescue again. He ended up having his “driver” take us home, a considerable distance out of the way. We were very grateful. I have to admit that cleaning up and puting hats etc. away after this kind of party is quite a chore. However, it was a memorable evening and everyone enjoyed it immensely. Buddy, my Miniature Schnauzer, kept me company as I put my house back together again. 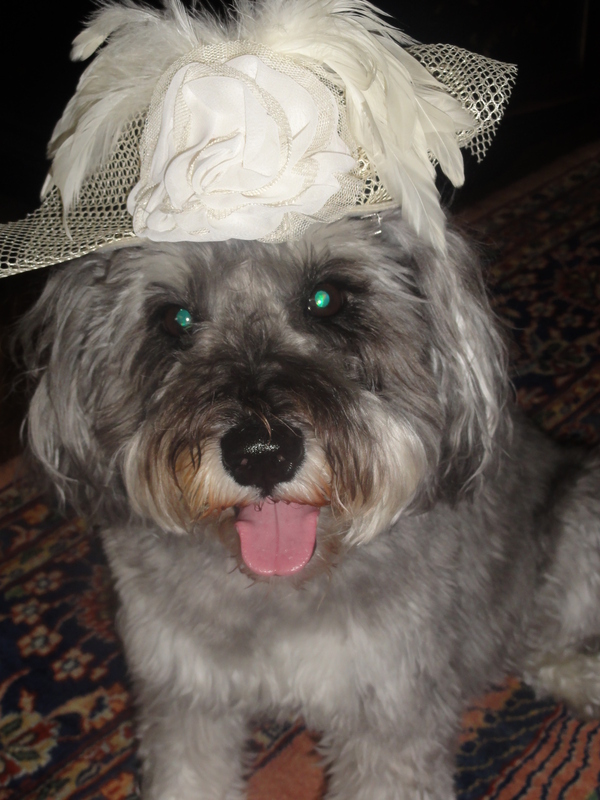 Buddy loves hats! You don’t have to have a hat collection to have a wonderful hat party. Just have everyone wear their own favorite hat and see how much fun you will have. A hat makes you feel graceful and elegant. Men will notice and compliment you. And they may even buy you some champagne!